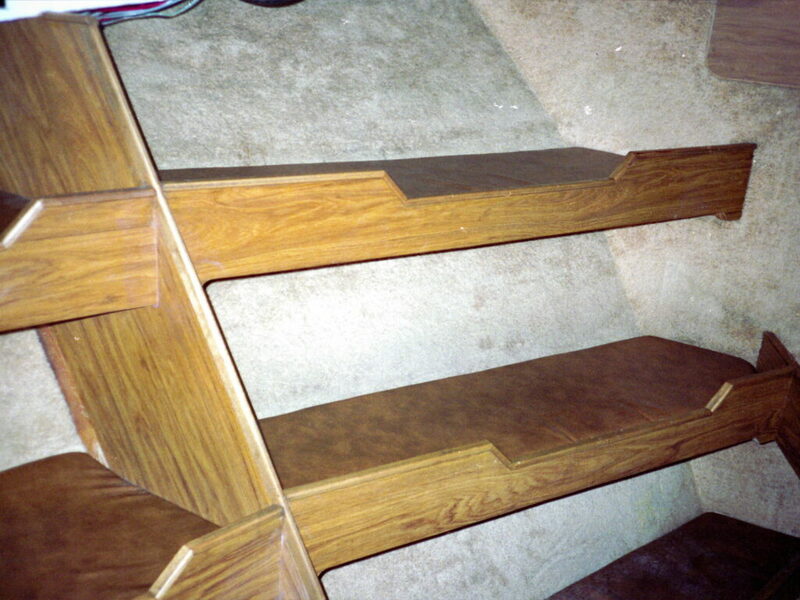 I got a phone call at my home in Kodiak, Alaska in late March of 1989 from someone who I did not know. The person at the other end said they were a friend of a friend and needed information about shipwrecks. I had become known around town as “that shipwreck guy” because I spent so much time at the local library researching shipwrecks. The person on the phone said they were from the Alaska Department of Environmental Conservation and wanted to know if I could find any information about large shipwrecks in northern climates where a large quantity of oil had been introduced into the marine environment. They needed facts, figures and as much information as I could find about the consequences of disasters involving oil spills. The request was made with a sense of urgency that came across the line like a bad smell. I knew something was up and asked for an explanation. Apparently a supertanker named Exxon Valdez had run aground and there was the possibility of a large release of oil. Oil in the water from a fishing boat had already become an annoyance to those of us in commercial fishing. 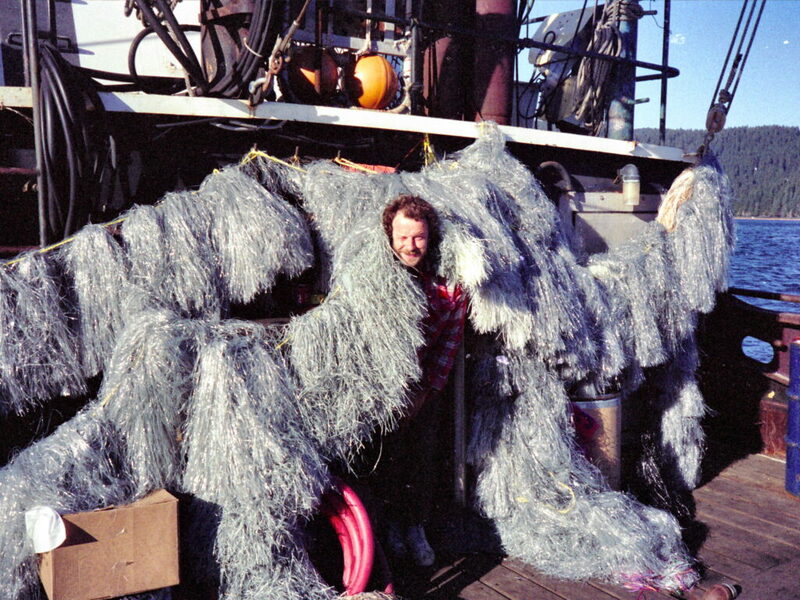 I had been involved in the fishing industry for almost two decades and had worked all over the state of Alaska. Lately we were being regulated and fined for a number of bad habits, not the least of which was spilling oil. Little did I know that the phone call from the ADEC would end my commercial fishing career in a way that I had not even imagined possible. It was evening but the library was less than a block from my house, so I took down the man’s number and promised to have information later that evening. I got to the Holmes-Johnson Memorial Library just before Happy Hour at Tony’s, my favorite bar, which was also just down the street. At Tony’s, we were preparing for the Annual Pillar Mountain Classic and I was one of the organizers. 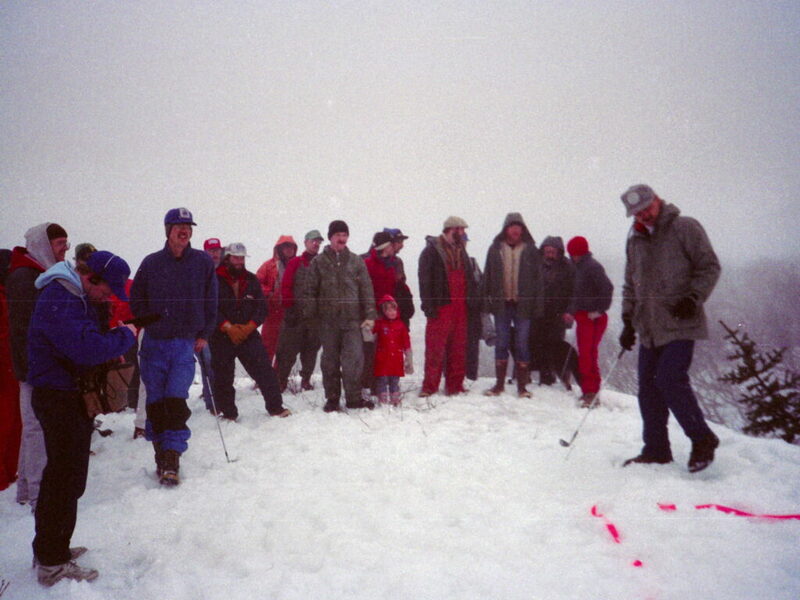 It was a one hole par 70 golf tournament from sea level to mountain top a group of fellow fishermen had put together in 1985. I won it the first year. 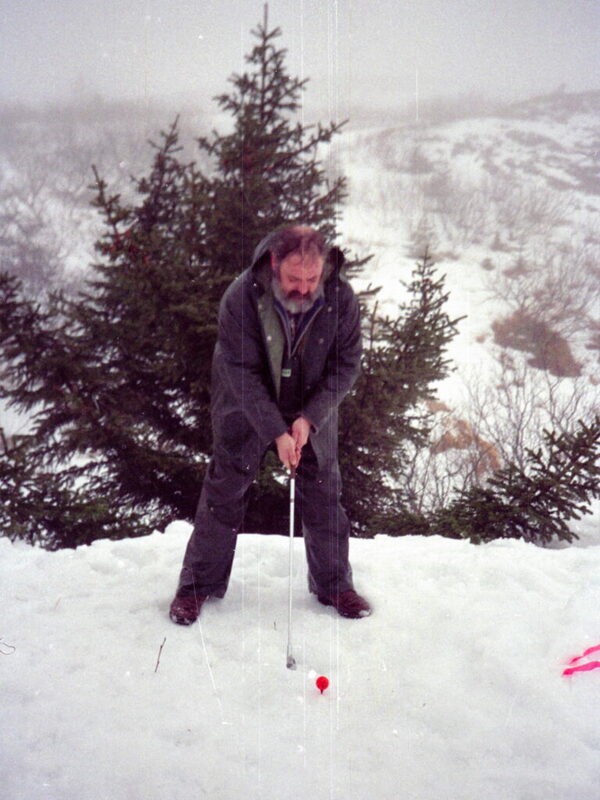 Practicing for the Pillar Mountain Golf Tournament in March of 1989. At the library I was able to find two significant oil spills that fit the request; the Amoco Cadiz of March 16, 1978 on the coast of France and the Tsesis of October 26, 1977 off of Sodertalje, Sweden in the northern Baltic. I looked over the information and checked out the books where the articles appeared. I made my Pillar Mountain Golf meeting a little late but nothing could keep me from playing in the Tournament. I was a one time champion and had to defend my honor. 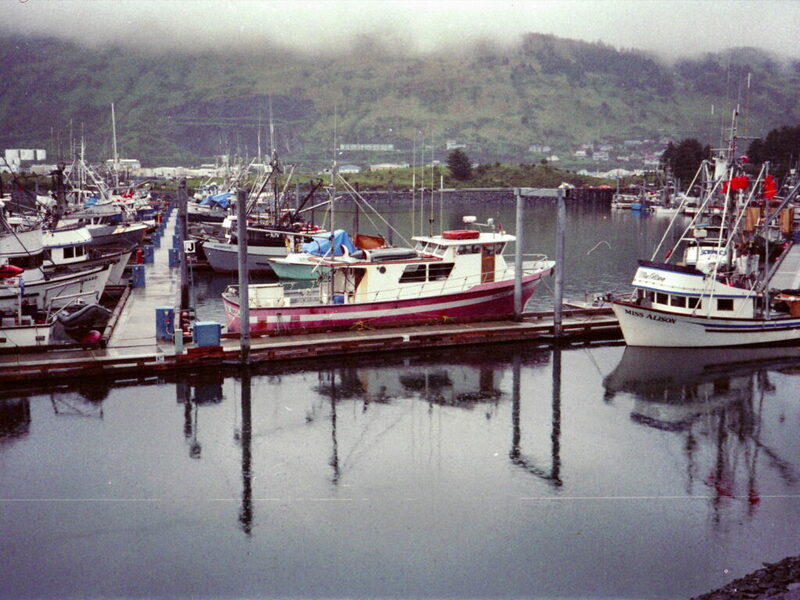 The Kodiak small boat harbor was usually a quit place in March. 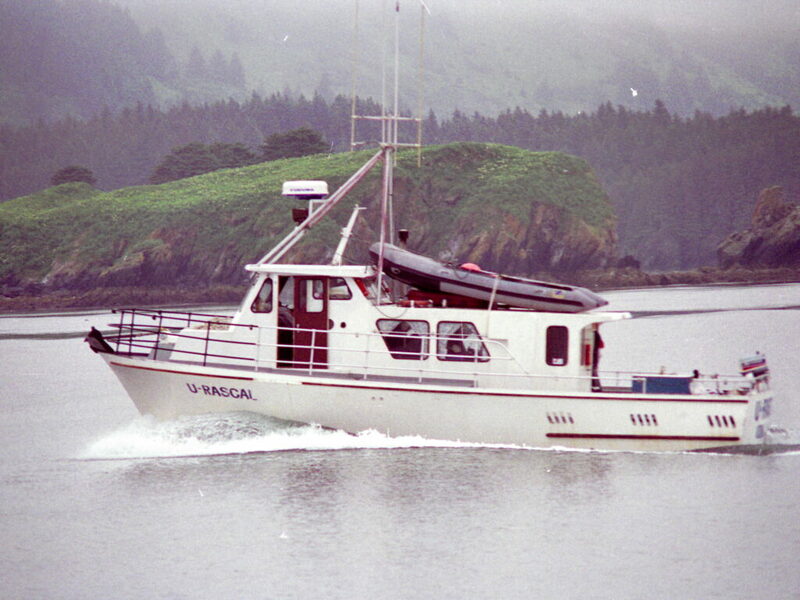 A lone vessel comes into Kodiak from the north. 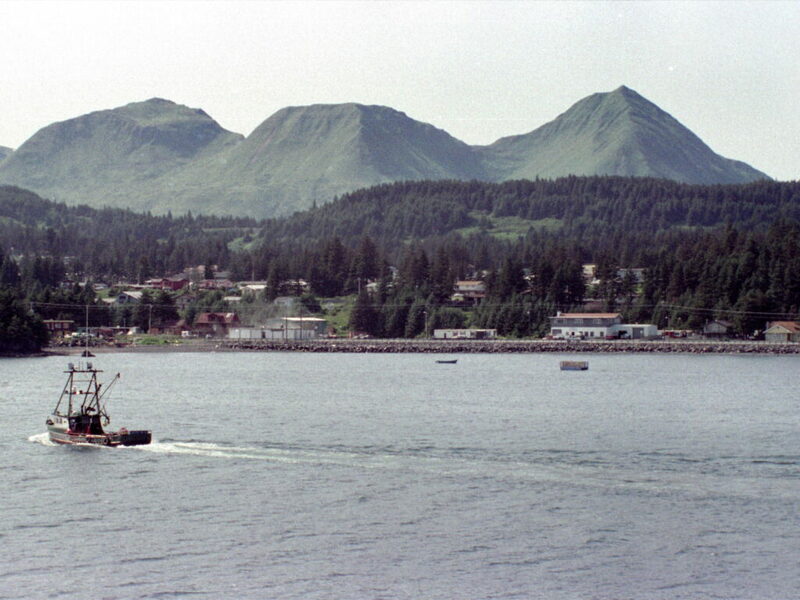 In late March of 1989 something new and terrible began marching toward Kodiak from the north, specifically, from the Bligh Reef area of Prince William Sound. Not realizing that the event in Prince William Sound would have an effect on Kodiak and my life, I went on about my business that day in late March. The golf tournament was only a day or two away and that was at the forefront of my activities list. Those of us who participated in the golf had been practicing for weeks. 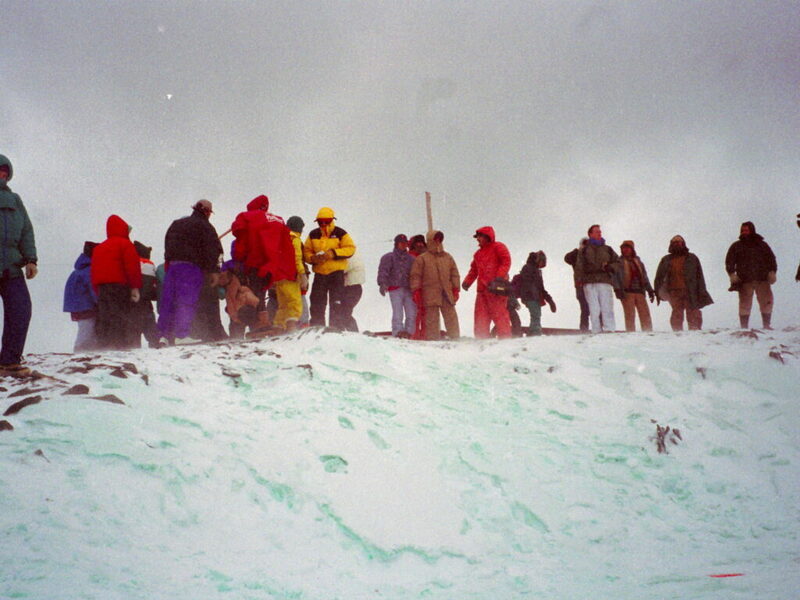 The flag and cup (a five gallon bucket) had been placed at the top of Pillar Mountain and the sign up sheet was full of golfers, team members and sponsors names. 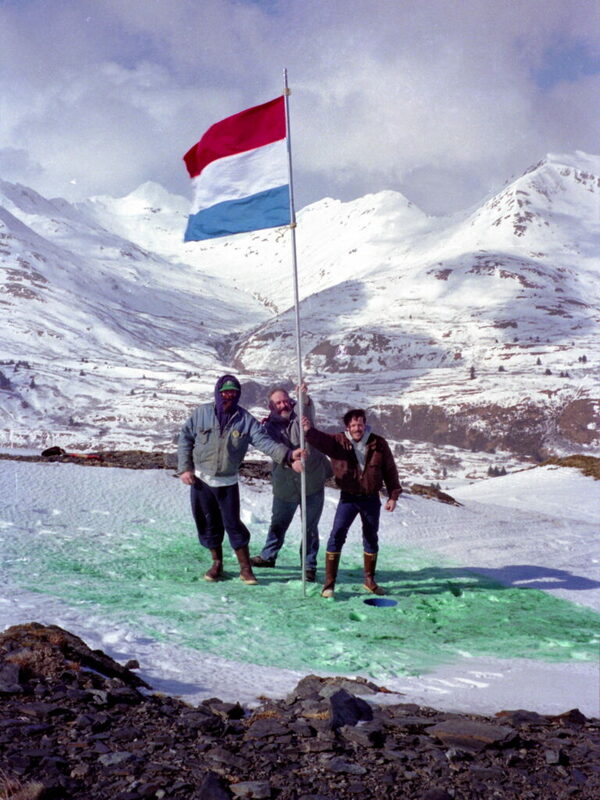 Glen Yngve, Dell Jackson and Warren Good pose with the flag at the top of Pillar Mountain just above Kodiak. 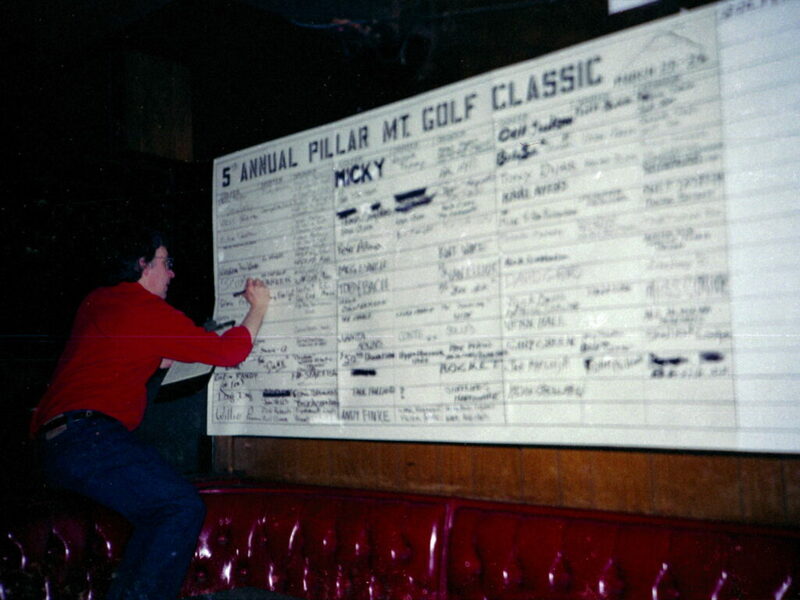 The 1989 sign up sheet at Tony’s Bar and Grill was filling fast with golfers daring to challenge Pillar Mountain to a game of golf. 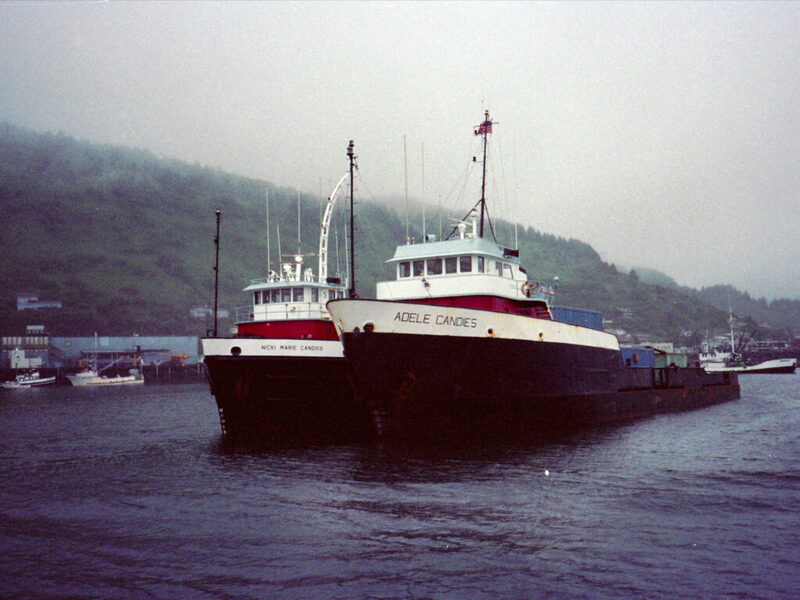 Not realizing that oil was gushing out of the hull of the supertanker Exxon Valdez up in Prince William Sound, most of us in Kodiak went about our usual business. My day consisted of practicing to play golf up a mountain, doing shipwreck research at the library and looking for work in the up and coming herring season. 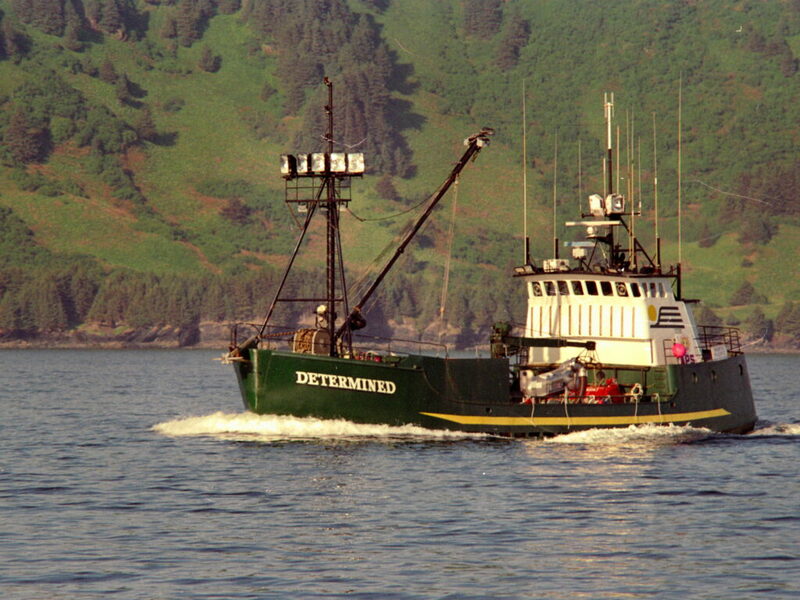 I had a good lead on a Prince William Sound herring job and was looking forward to getting back up to that area. 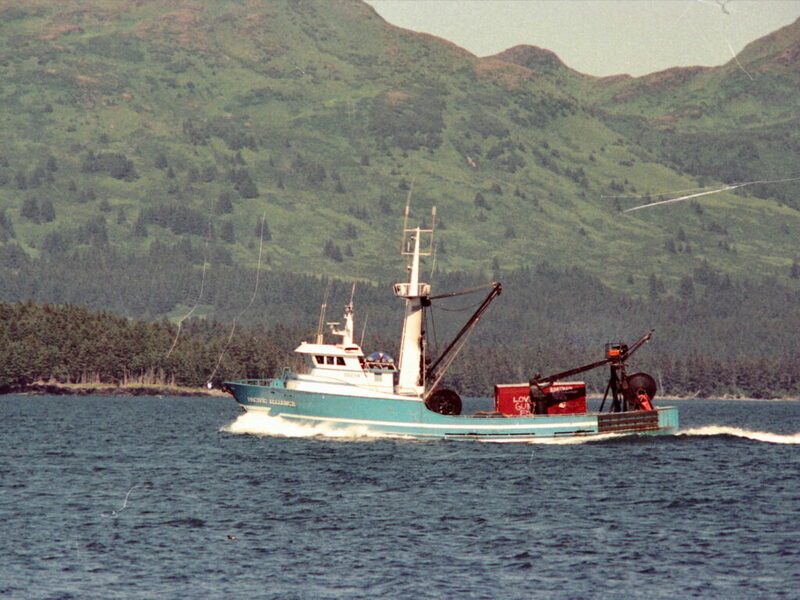 I had been the engineer tendering herring aboard the Elizabeth F in Prince William Sound in recent years and was hoping to get back to the Sound. 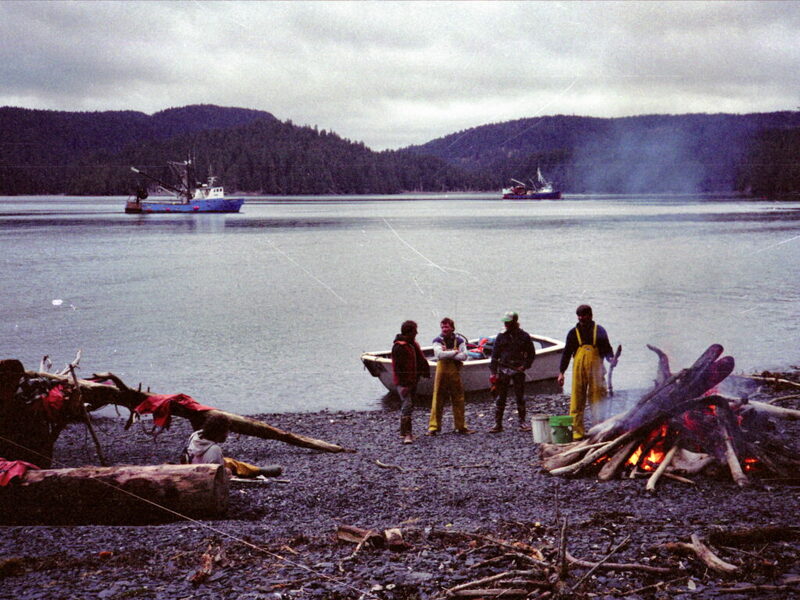 Prince William Sound was one of the most beautiful areas of Alaska and tendering herring was laid back work. This group of tenders and seiners was waiting for the season to open back in the mid 1980’s. We teed off the golf tournament the morning of Saturday March 25, 1989. There were rumors circulating of terrible things that might be happening in Prince William Sound with the tanker that was on Bligh Reef. None of us paid much attention as we tackled the one hole par 70 challenge ahead of us. I was somewhat concerned about my potential job tendering herring but my options for employment had broadened considerably in recent months. I had gotten a Master Captain’s License and could now legally haul passengers for money. That did not help my golf game. 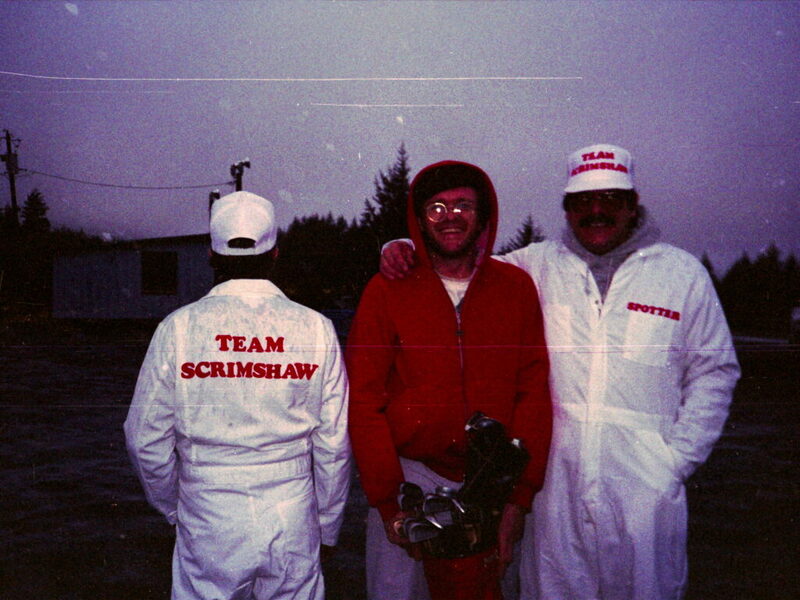 Some Pillar Mountain golfers had their own uniforms as seen here with Steve “Scrimshaw” Matthews who was a previous winner. It usually rained at the tee off area down by the VFW. 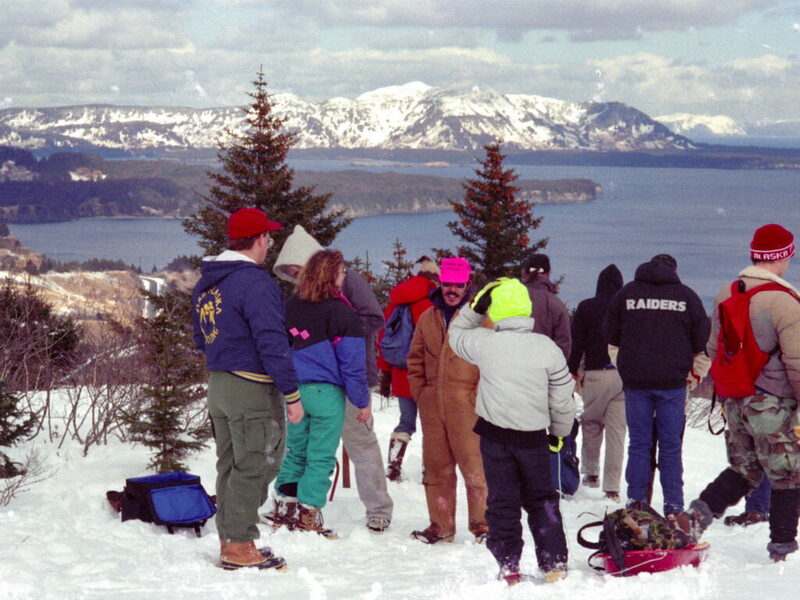 By the time you were a few hundred feet up the mountain you were in deep snow. The lower part of the course was treacherous. 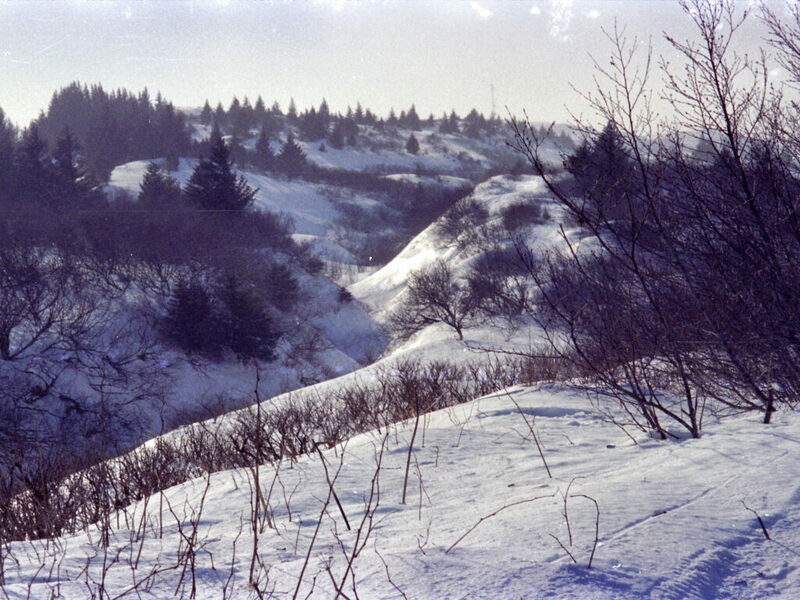 Ravines filled with snow presented an unseen danger with water flowing beneath the snow. 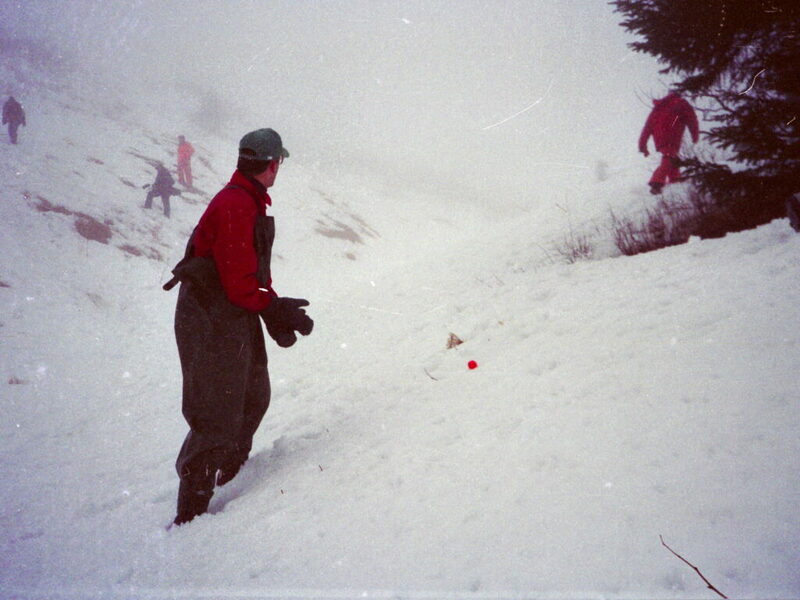 Getting wet while golfing usually meant a quick slide back down the mountain to the VFW to warm up and prevent hypothermia. The Pillar Mountain Classic was originally a bar bet between fishermen and fisherwomen but had evolved into a charity drive. The primary recipients of all funds were a scholarship at the Kodiak High School and blankets for the hypothermia ward at the local hospital. It was a two day event with the second day qualifiers playing from the halfway point up the mountain. 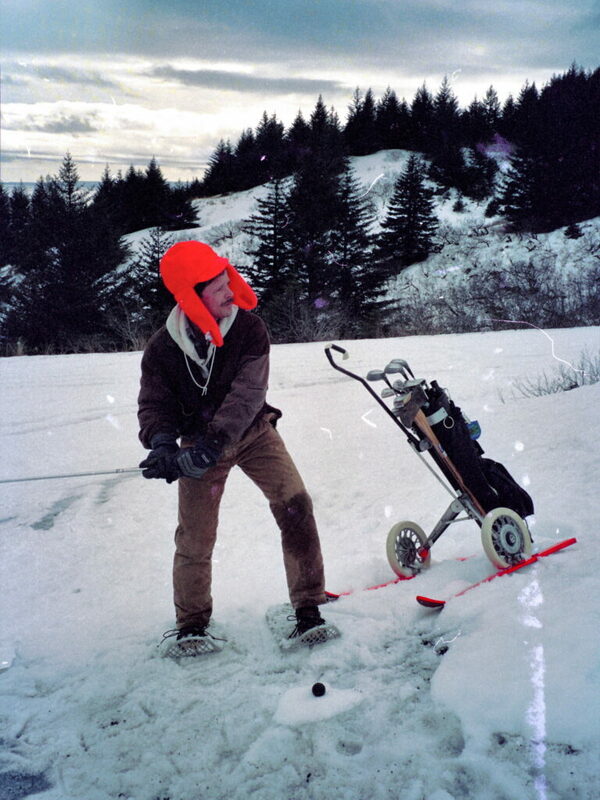 At the second day tee off area March 26, 1989 the topic of conversation was shifting away from golf through the snow . 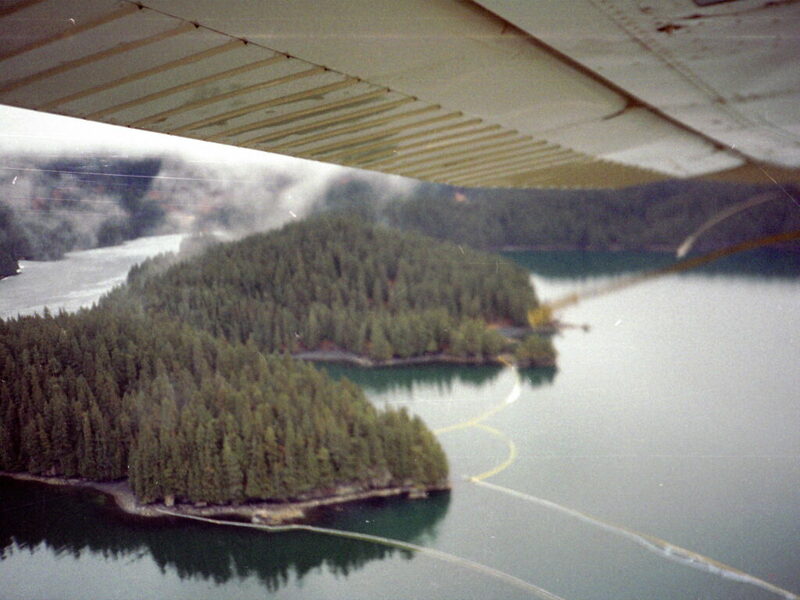 Oil in the water in Prince William Sound was moving and possibly heading toward Kodiak. Occasionally the clouds would allow a clear view to the north past Spruce and Afognak Islands beyond which was Cook Inlet. 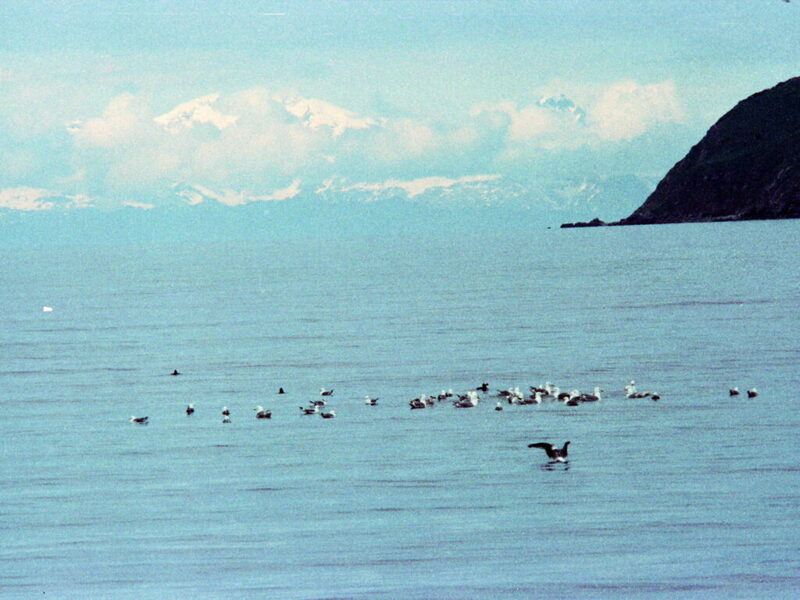 Past that was Seward after which was Prince William Sound many many miles away. For the moment we focused on the challenge at hand. 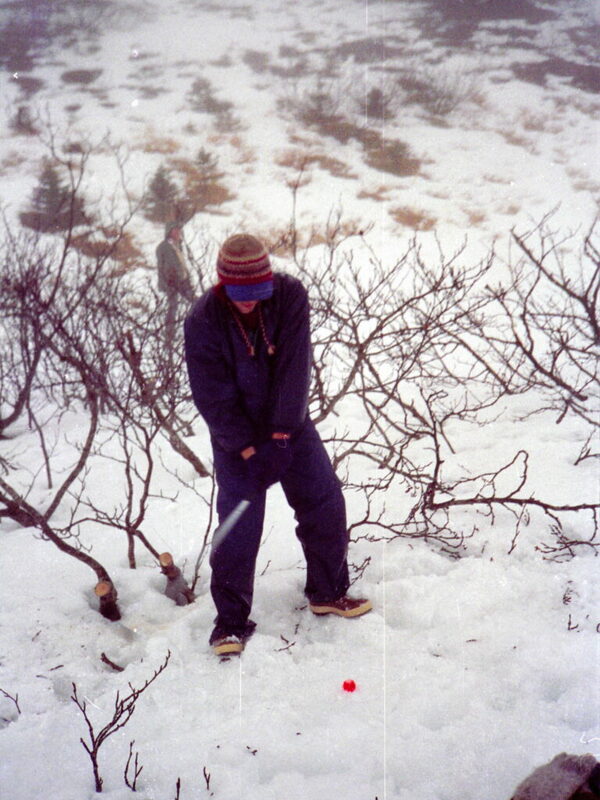 Hitting an orange golf ball to the top of the mountain in the fewest number of strokes was the task at hand. Here Dell Jackson of Kodiak prepares to begin the second day of the tournament and the fifth day of the oil spill. Contestants were allowed to trim back the alder bushes but not saw down trees. Almost all lies were unplayable but we played them anyway. 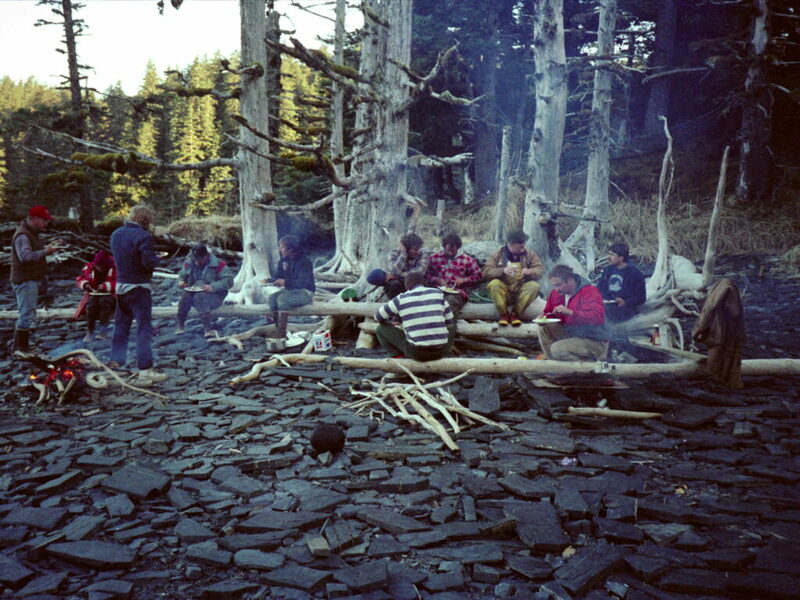 We were the fishermen and fisherwomen of Kodiak. 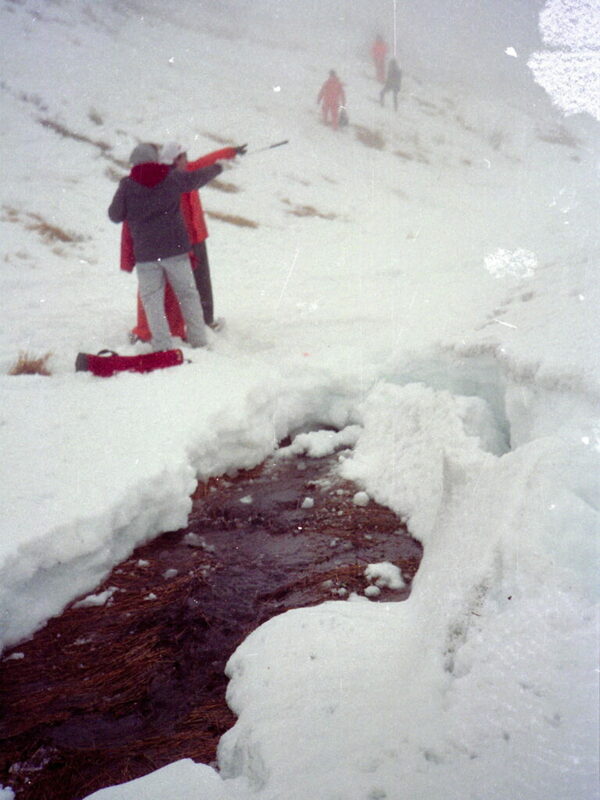 A lady golfer prepares to launch her ball over the “ravine of doom”. 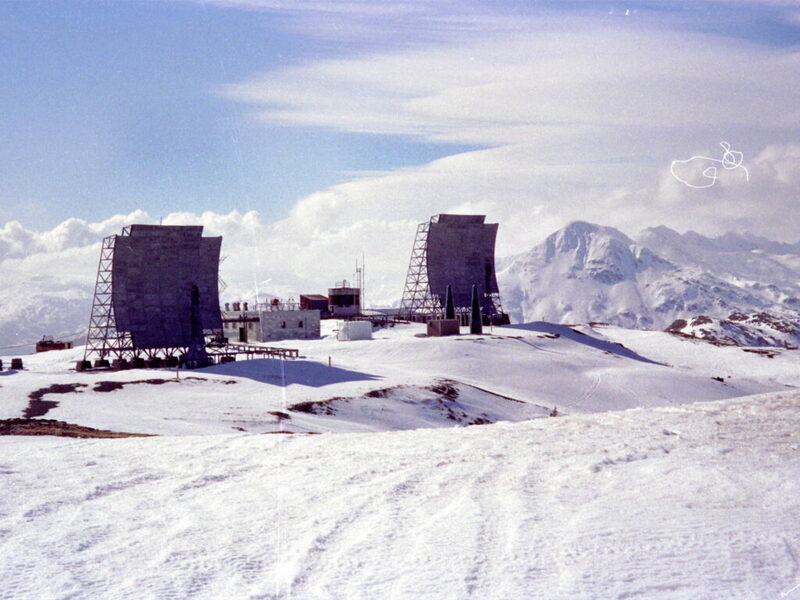 The view to the south from the top of Pillar Mountain is of “White Alice” a WWII radar installation. 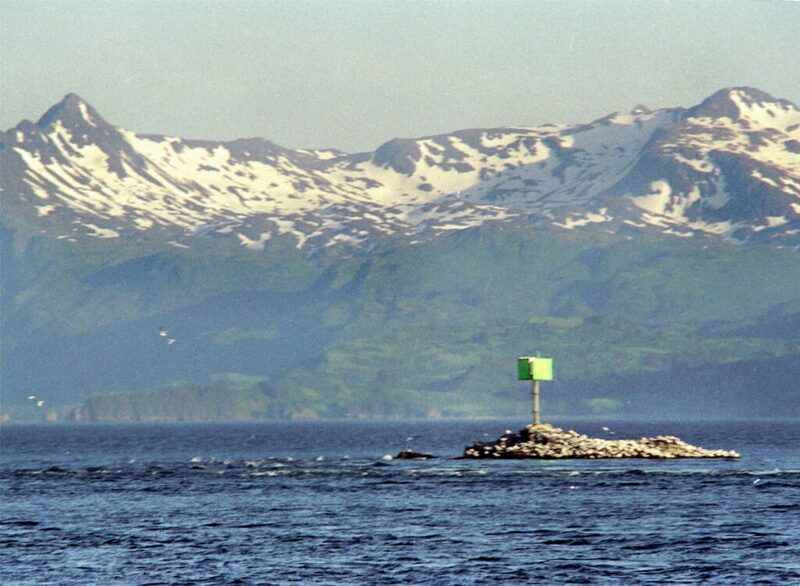 Behind the radar array and down a couple thousand feet is the town of Kodiak. The cup at the top of the mountain is in the lower right of this picture in an old snow filled WWII bunker. Winds up there are usually at least gale force and below freezing. 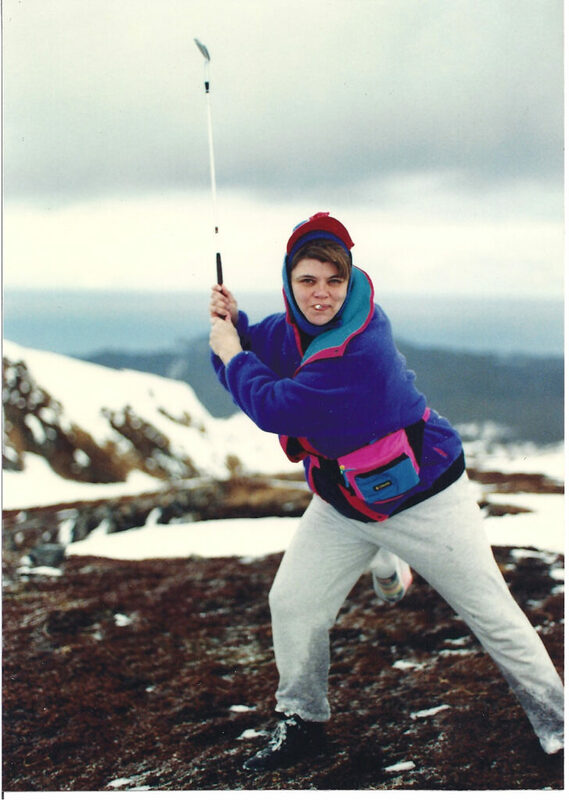 When all was said and done in our charity drive golf tournament that evening of March 26, 1989 all attention immediately shifted to what was happening to the north in the gulf of Alaska. 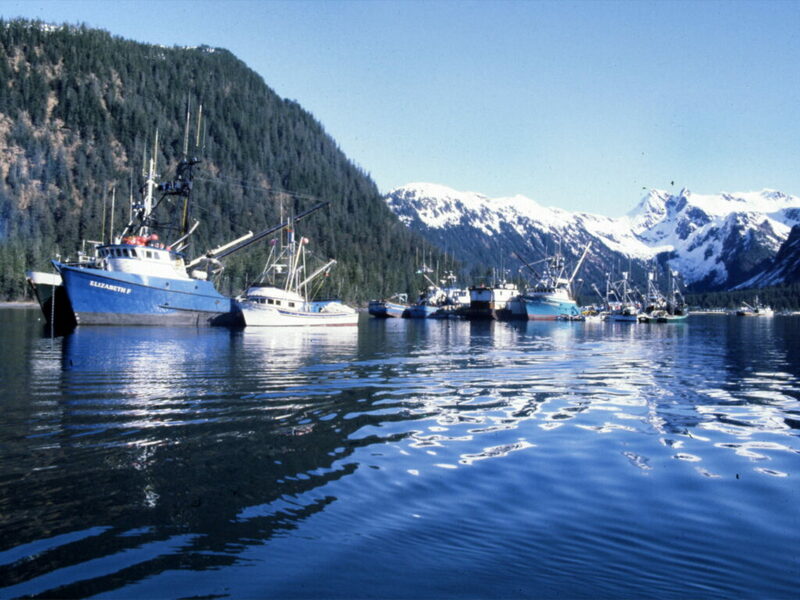 The oil had begun moving out of Prince William Sound and into the Gulf of Alaska. There were alarmists who claimed it could find its way all the way down to the Kodiak Island archipelago. Most of us thought that was absurd. 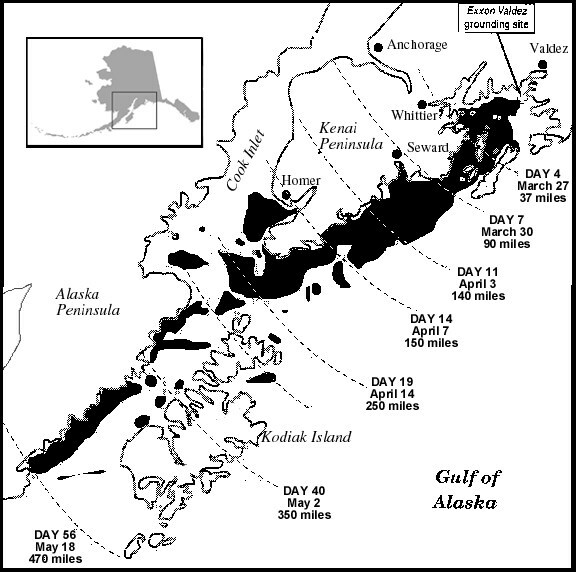 Little did we know that with each outgoing tide hundreds of thousands of gallons of crude oil was seeping out of the sound into the Alaska Stream Current. That current flowed counter clockwise around the Gulf of Alaska. From Prince William Sound it flowed south and west past Seward, the Kenai Peninsula, past Kodiak Island and on down the Alaska Peninsula toward the Aleutian Chain. In 1989, there was very little information available about the currents around Alaska. The fishermen knew but serious studies were not conducted and published until years later. This depiction of the flow of water around the Gulf of Alaska came out many years after the Exxon Valdez oil spill. This map of the progress and movement of the oil spill came out after the fact. 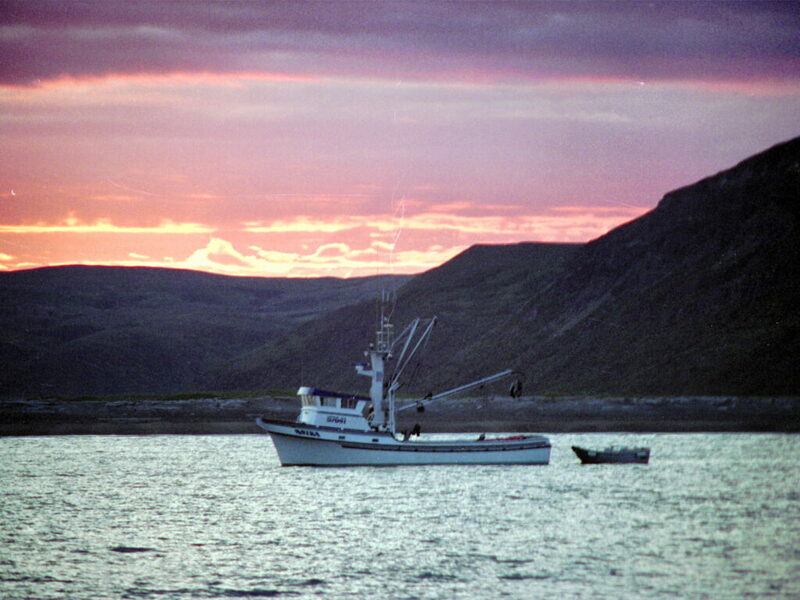 The oil went from Chenega to Chiniak to Chignik in less than two months effectively shutting down a large part of Alaska’s Commercial Fishing Industry. 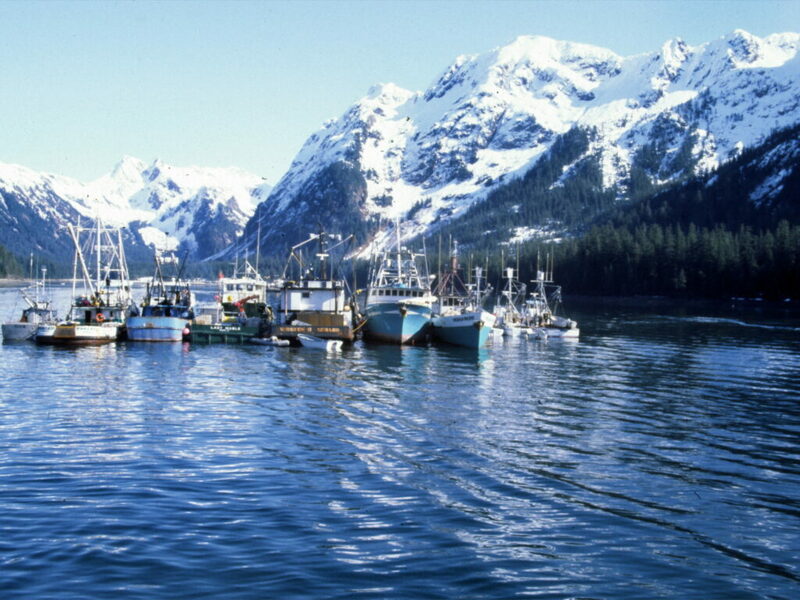 It wasn’t until several days after the tournament that what was happening in Prince William Sound began to sink in. 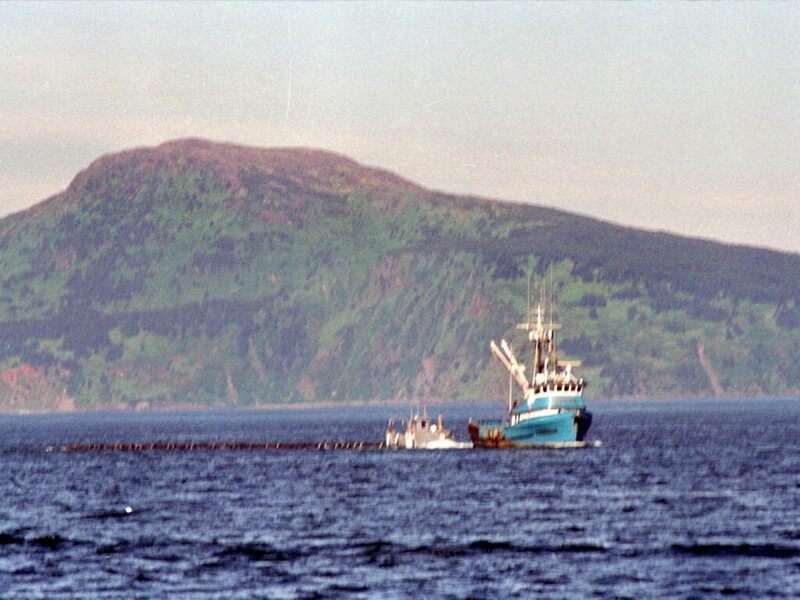 On the 30th the oil had begun to arrive in the Seward area. It was the closest population center and now things got loud. Most of the headlines in the papers were all capital letters. President Bush was making alarming statements as was Governor Cowper. The spill was said to have reached 500 square miles and contained 10.1 million gallons of oil. 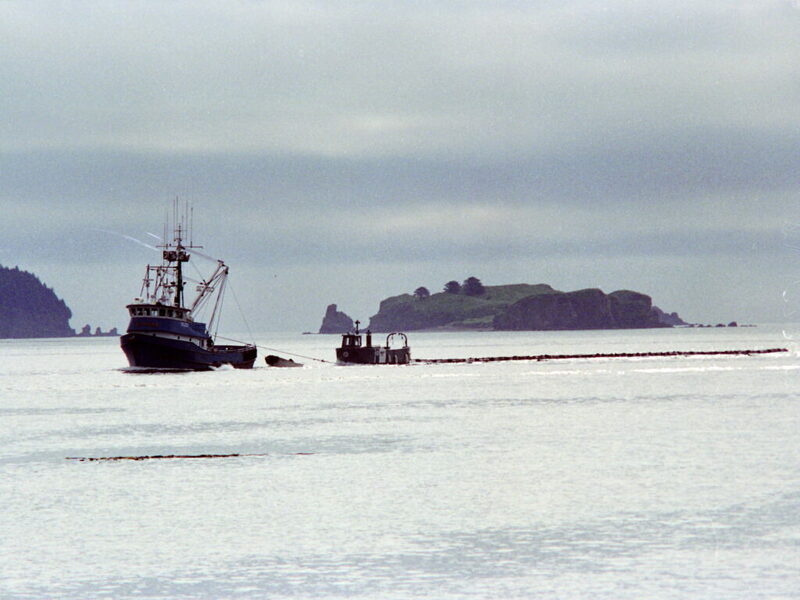 Vessels and crews had been sent to Port Saint Juan, Eshamy Bay and Main Bay to attempt to save the salmon fingerlings at the hatcheries in those bays. 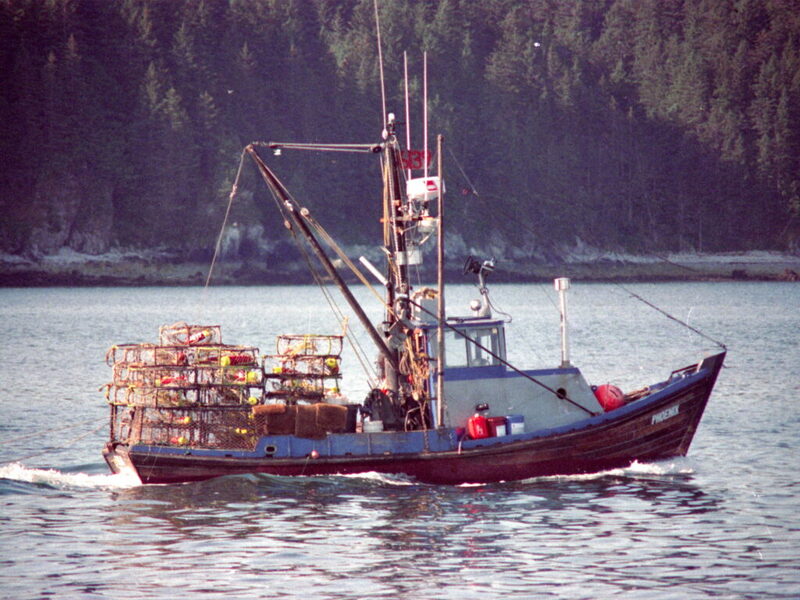 The loss to the fishing community was already estimated to be 150 million. The people of Kodiak and other communities in the area were beyond concerned. Like wild horses penned in a coral with a thunderstorm moving in, they were unsettled to say the least. Something had to be done if this tragedy was evolving. Local fisheries were going to be damaged if only because they were shut down. 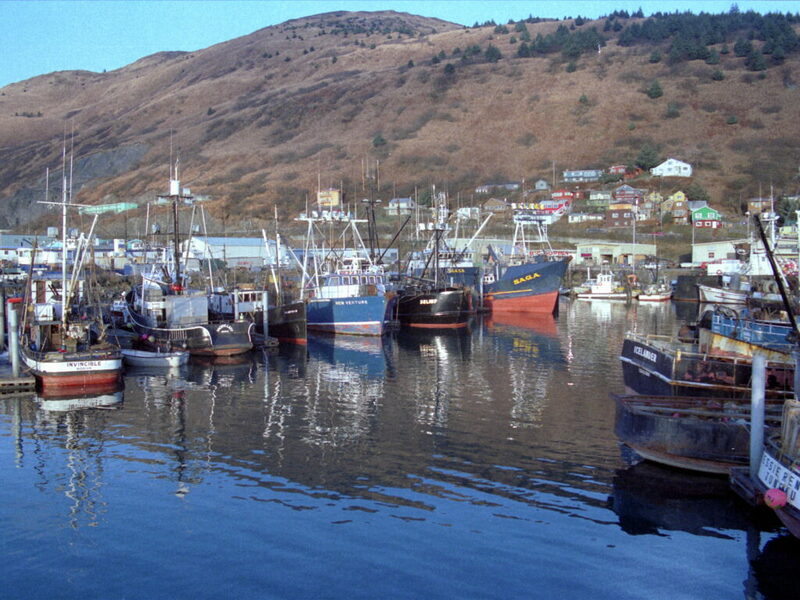 Those who could loaded up on fuel and rations and headed out the the hatcheries around Kodiak Island to assist in setting up some kind of barriers to protect the fry and fingerling salmon. Those tiny fish represented years of effort and the future of area salmon runs. I got stuck in Kodiak with a toothache and subsequent dentist appointment. That turned out to be fortuitous. My dentist owned a 50 foot charter boat he wasn’t using and I had a new Master Captain’s license begging to be put to good use. Once he eliminated my dental problems we sat down and discussed how we could put together a plan to help in the unfolding disaster. We solicited the assistance of an attorney to draw up a contract between the two of us. 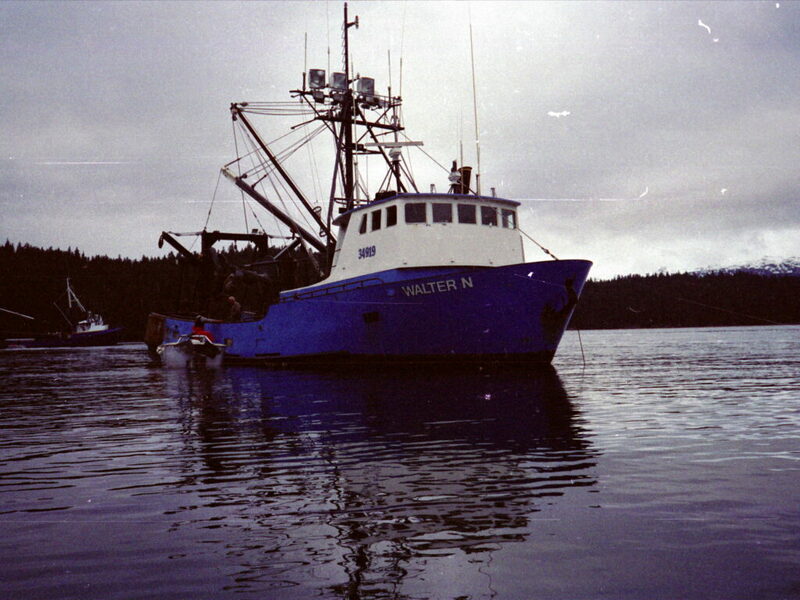 While that was in the works, I was called upon by a local company, Brechan Enterprises, that owned the fishing vessel Walter N which I had worked on several times before. 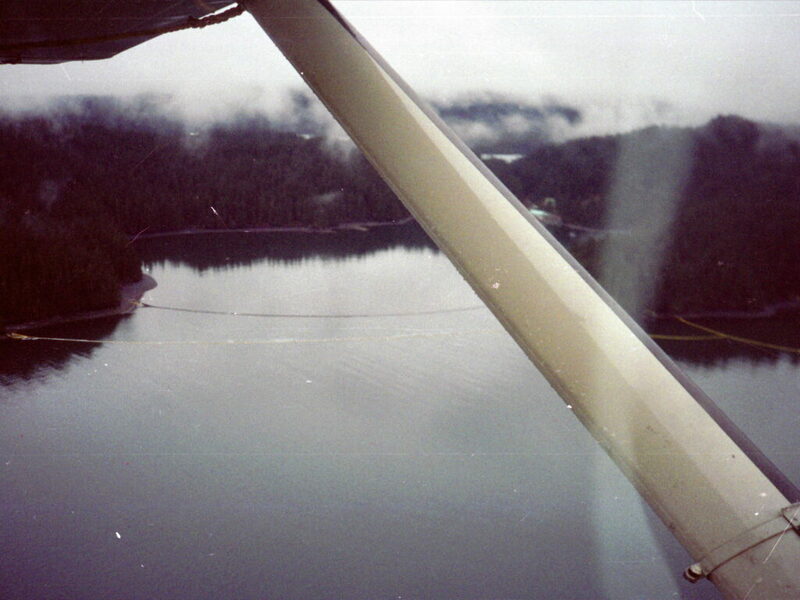 I was asked to fly out the the Kitoi Bay Hatchery where the Walter N was anchored. 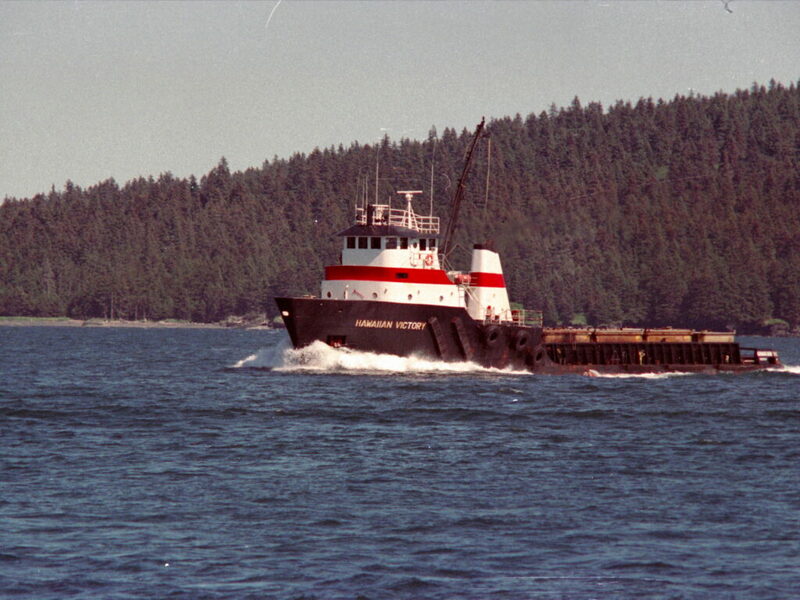 Brechan had sent the vessel and her crew to assist in the construction of a large log boom across the entrance to the bay where Kitoi Bay Hatchery was located. My transportation from Kodiak to Kitoi Bay Hatchery. 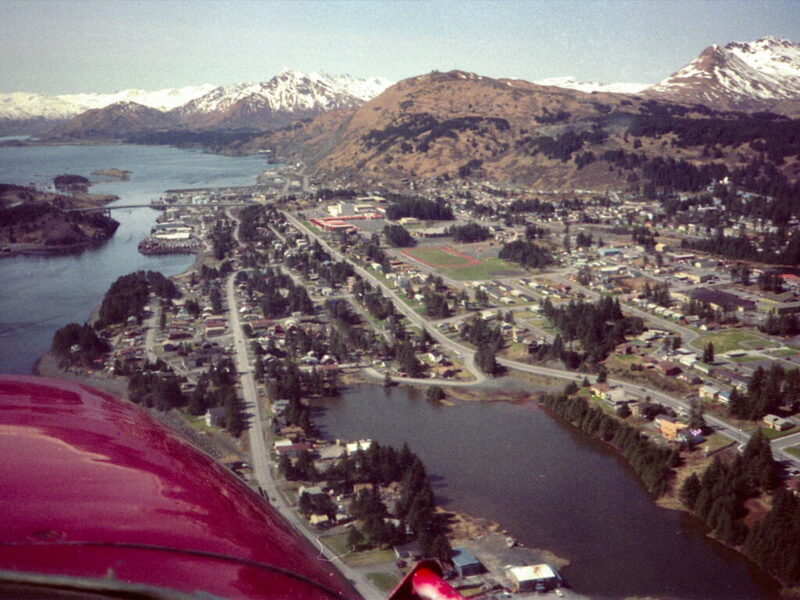 Looking south over the town of Kodiak as we set course across Marmot Bay to the Kitoi Bay Hatchery. As we approached the hatchery I could see what looked like salmon seines stretched across the mouth of the bay. It appeared that multiple layers of defenses had been set up prior to my arrival. I dropped my gear on board the vessel where I would be berthed. Brechan had agreed to pay tendering wages and house and feed the crew aboard their vessel Walter N.
I arrived on the beach late in the day to find several boat crews attending to a duty that brings tears to my eyes even 30 years later. 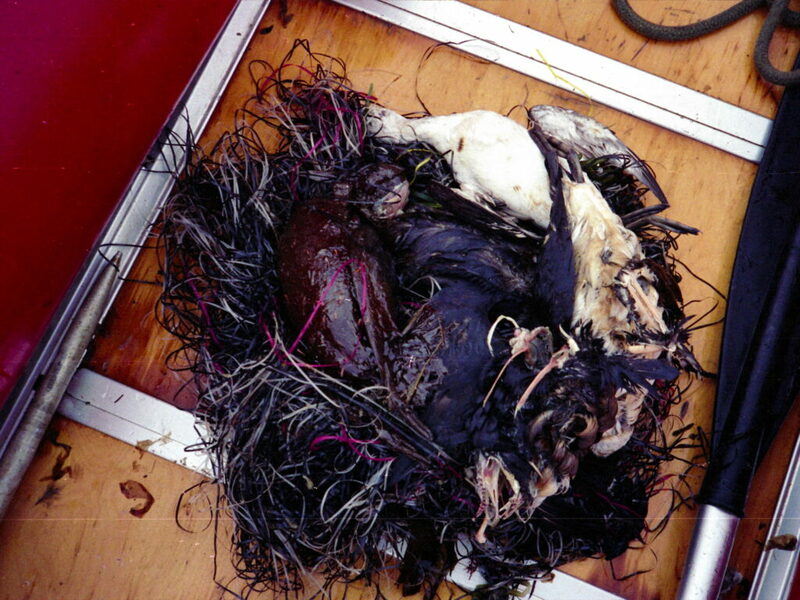 They were cremating the remains of oil soaked birds and other creatures as they floated in from the north. 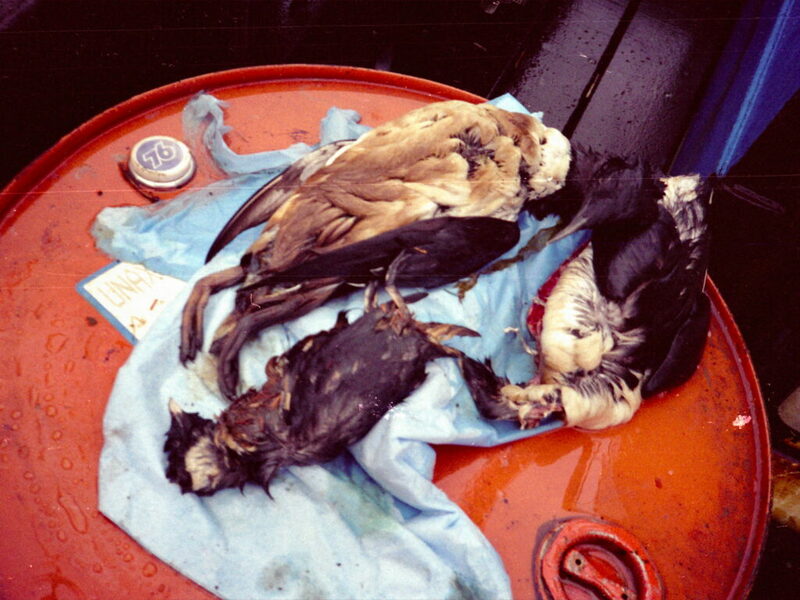 Murres, murrelets, cormorants and many other species of water fowl were the predominant casualties. Some of the carcasses were completely oil soaked where others were only lightly stained. All were very dead. All were very combustible. 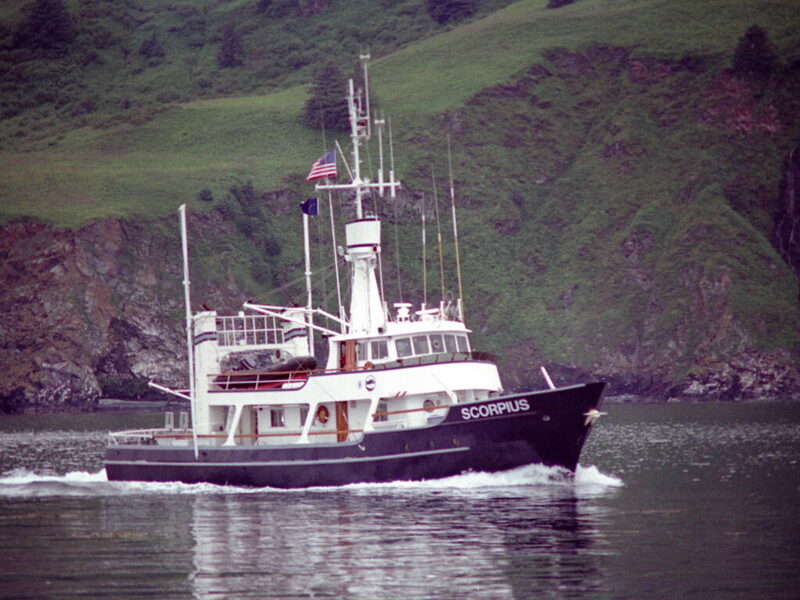 I only stayed at Kitoi Bay for a week so that the captain of the Walter N could return to Kodiak on business. 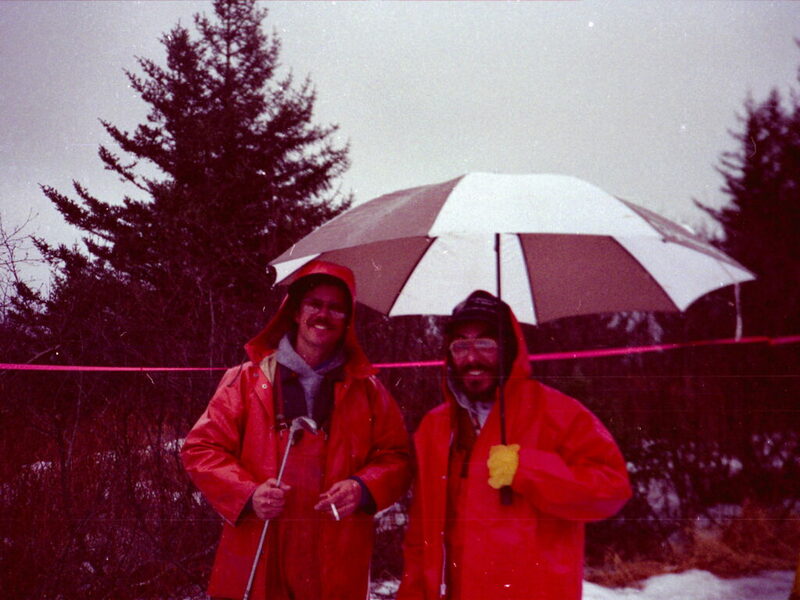 On my second day I was introduced to the activities of those who were attempting to protect the salmon hatchery. They had set up two primary defenses across the mouth of Kitoi Bay. The outer defense consisted of a string of bright yellow or orange oil boom that stretched all the way from headland to headland across the bay. Attached to the full length of this was a white oil absorbent boom meant to snag as much of what was coming in as possible. Oil boom being delivered and deployed outside Kitoi Bay. What was coming in with the flood tides were described as tar balls. They looked like a piece of chocolate candy that had been left on the hood of a car on a hot day. If you touched them you needed some kind of solvent to get the stain off your fingers. There was a second boom system inside of the yellow and white one that was constructed of large logs cabled together end for end all the way across the bay. 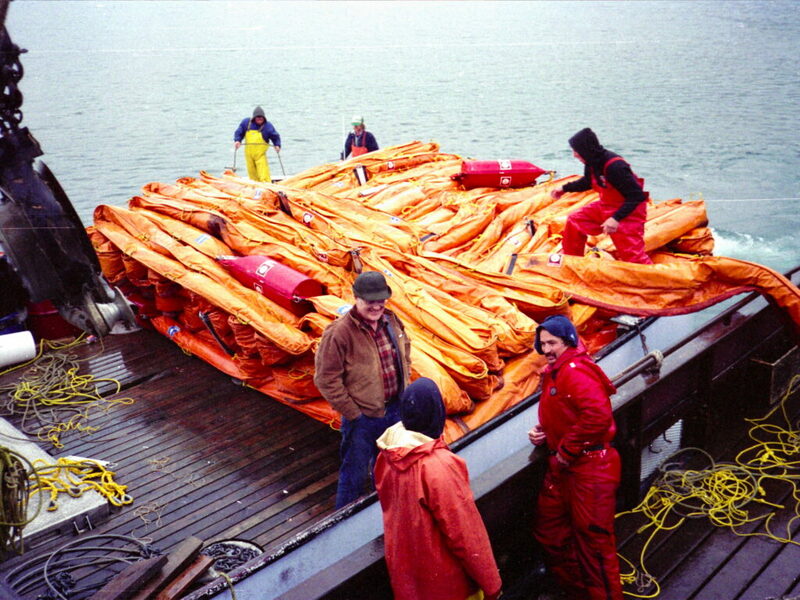 Some of the tar balls were jumping over the first boom system and attempts were being made to catch them on the logs. A material called oil snare was nicknamed Pom-Poms because they resembled what cheerleaders used. They were brought in to be attached to the logs. The pom-poms were strung together in long strands aboard the attending vessels. 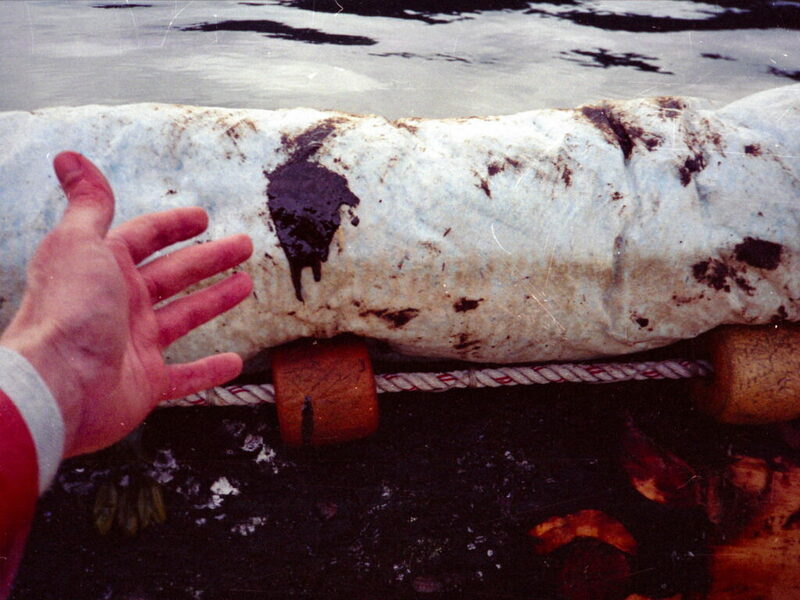 The pom-poms (oil snares) were taken out to the log booms to help snag tar balls before they could enter Kitoi Bay. 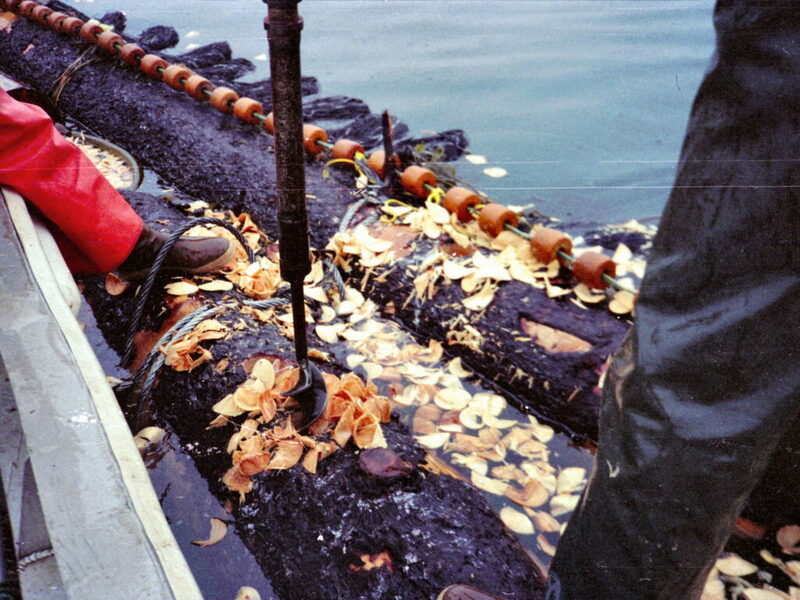 In addition to the oil snaring pom-poms, old salmon seines were draped over the log boom to hang down into the water column where it had been noted some tar balls were diving under the barricade as larger waves passed. The work was difficult and frustrating because there was no playbook to go by. We used whatever we could find to try to stop that oil from coming into the area of the fish hatchery. Attaching whatever we could find to prevent the oil from entering the area of the fish hatchery. 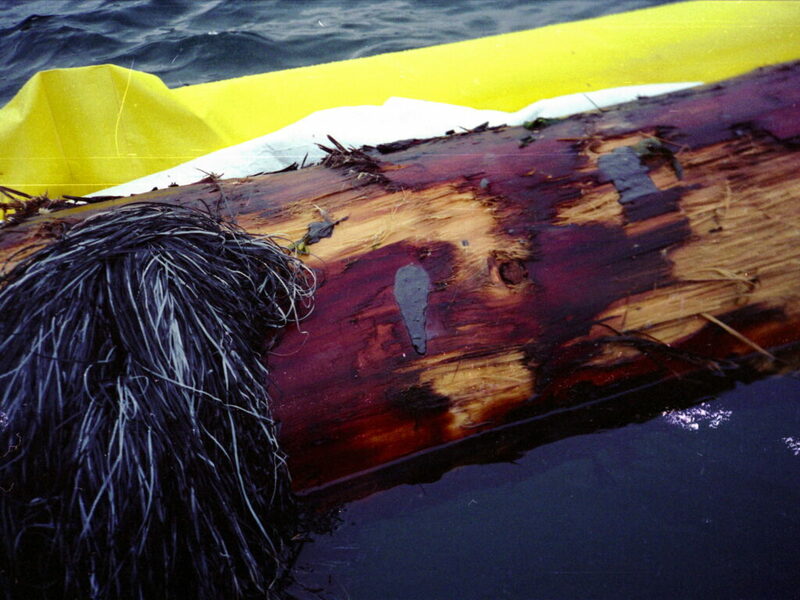 It was discovered after a minor weather event that the cable holding the log boom together was beginning to separate. 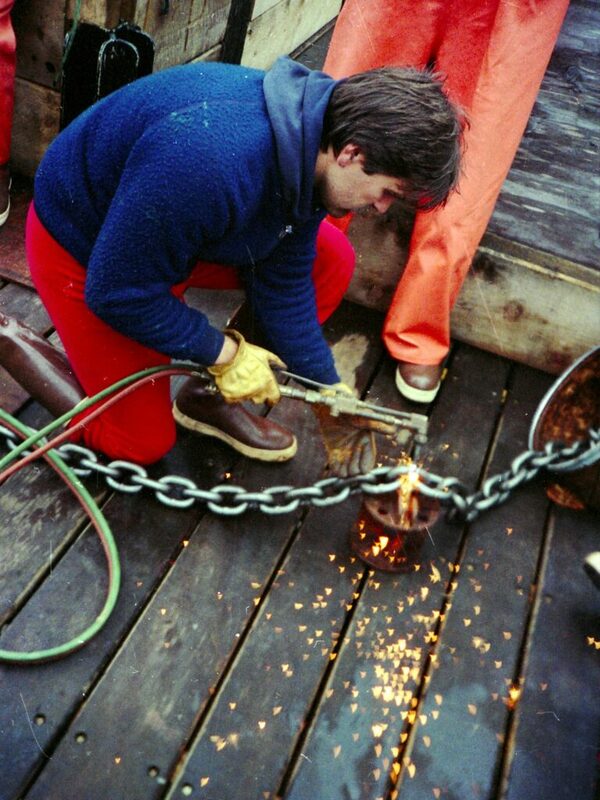 Anchor chain is being cut here by Captain Butch Gagne to be used to attempt to solve the problem. A large gasoline powered auger was enlisted to drill holes through the logs. The anchor chain was then threaded log to log and shackled in place. Like fishing, your jobs were many . 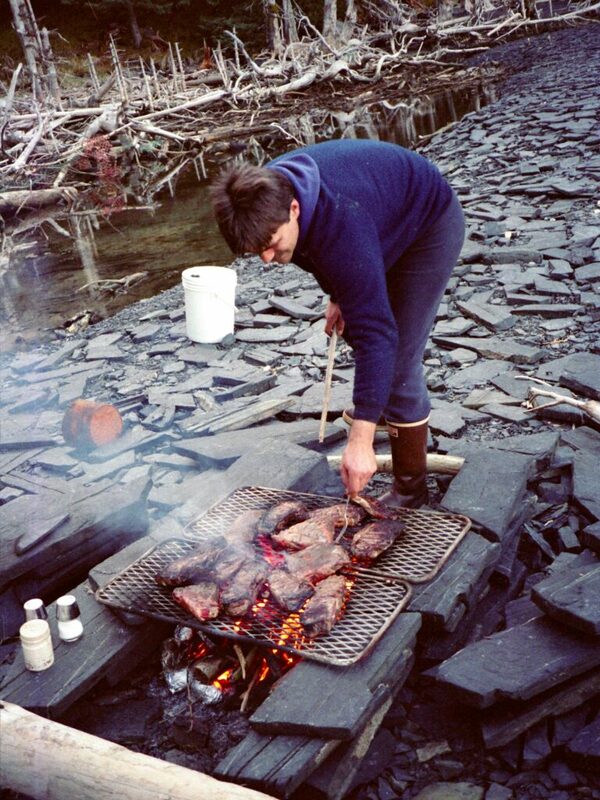 Here captain Gagne prepares some fresh steaks for the crew as nightfall approached. There is little I remember more fondly than the camaraderie of a group of capable people tasked with an almost impossible problem. With unfaltering optimism, they had no doubt they could solve any problem that could be thrown at them. Dinnertime was a brainstorming session every evening. 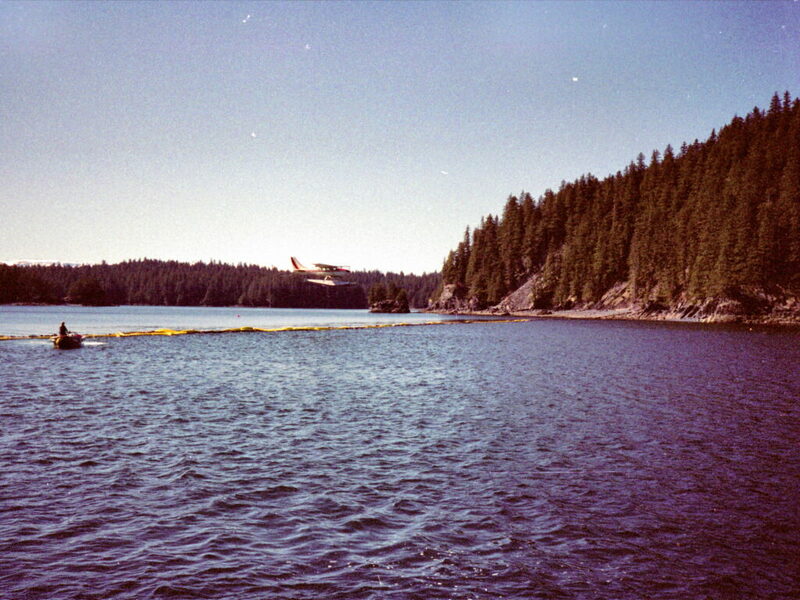 In mid May I was flown back to Kodiak. For the next month I looked for ways to get back out to the beaches where oil was coming in. The oil had found its way past the Kodiak Island Archipelago and was continuing south and west. The problem was evolving and emotions in town were at a fever pitch days on end. Happy Hour down at Tony’s Bar where we had organized the Pillar Mountain Golf Tournament was no longer happy. There was no credible information being disseminated to the fishermen and townspeople so speculation was rampant. My Dentist and I agreed to a contract where I could use his boat to help on the oil spill cleanup and we would share any profits after we paid expenses. He agreed to let me purchase the vessel if the venture was profitable enough. For several weeks I attempted to penetrate the complex and somewhat unorganized group of agencies and people that were in charge of the cleanup and response effort. Every night there was a television program on our local community TV station where a panel of supposed experts discussed what was happening with the spill. Our community leaders, representatives from Exxon and their affiliates, and numerous government officials hemmed and hawed, argued and cajoled. Around June 10th, I was surprised to hear my name come up. The Exxon Representative was arguing about why more Kodiak boats and skippers weren’t being used in the cleanup and response effort. 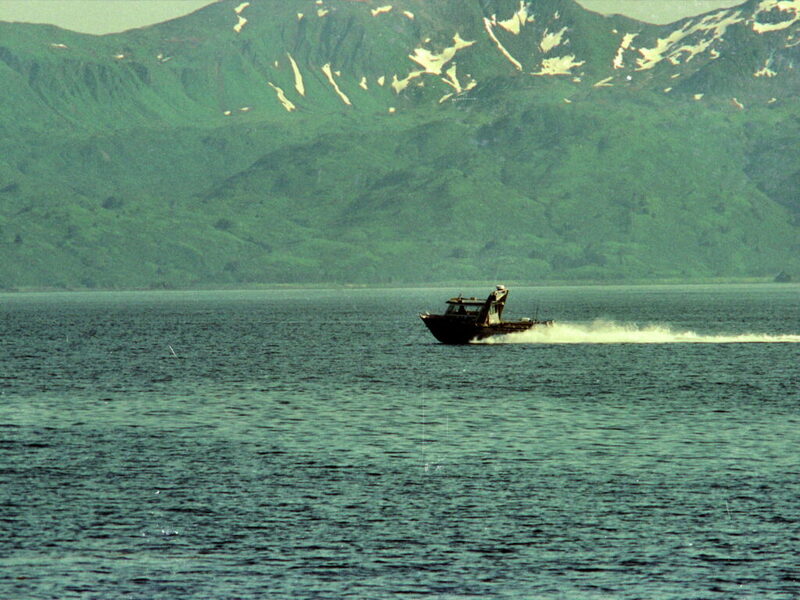 He had told a representative from the Alaska Department of Environmental Conservation that the Kodiak skippers did not have the licensing required. 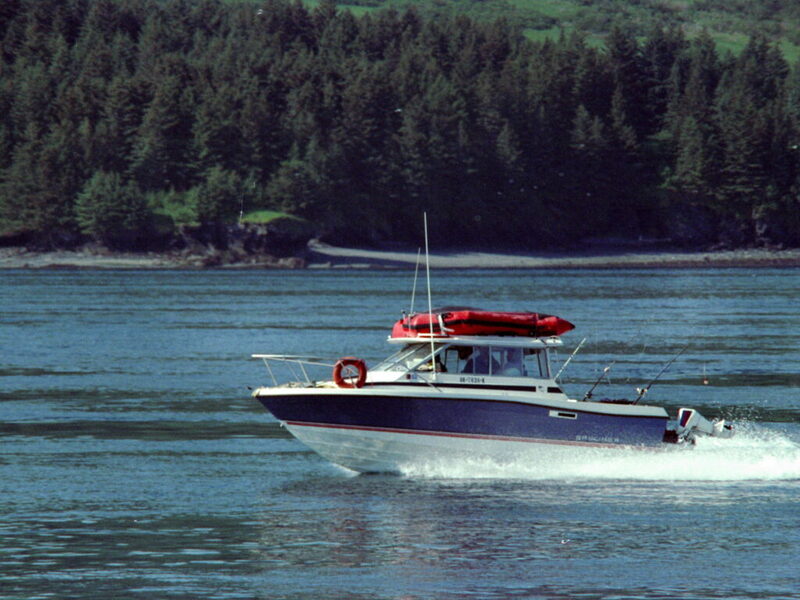 “Captain Warren Good not only has the proper licensing but also has access to a vessel designed to haul large number of passengers.” said an Alaska Department of Environmental Conservation man. I almost fell off my chair in amazement. How the hell did this government guy know my name and my circumstances? Then it hit me. This was the fellow that I had gotten the two books about oil spills in northern climates for from the library. I had been worrying that I was never going to see those books again and have to pay for them. What a way to return a favor. My telephone rang within five minutes. It was a lady from a company called VECO that wanted to know if I could come in and discuss going to work on the oil spill effort. I signed a contract the following morning. The boat I would be driving had the ugliest paint job I had ever seen on a charter vessel. It was 50 feet long overall, could get up on step, plane and make 20 knots and had enough life jackets for more than 40 people. She had seating for a dozen in the salon and galley area. Below deck there were a dozen bunks. The wheel house had a bunk aft and ample electronics for the job ahead. 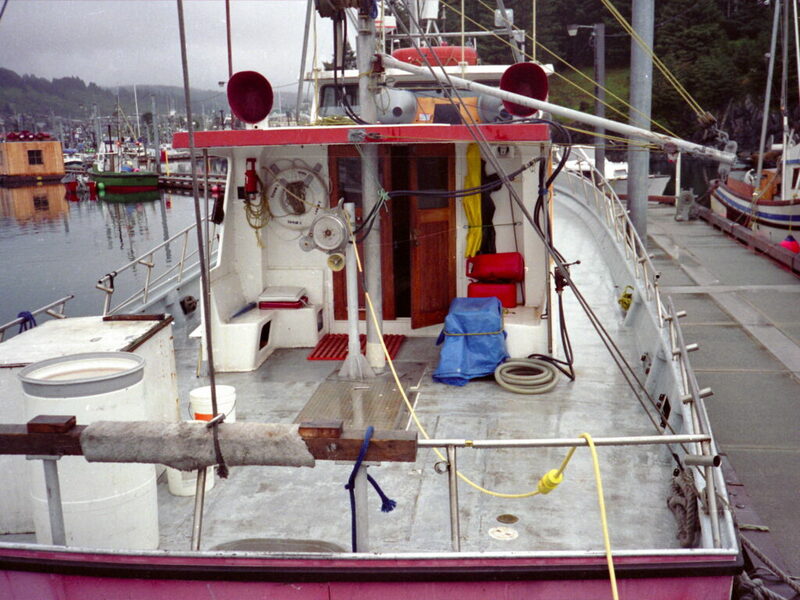 The deck was rigged for sport fishing and had a fish hold below. I went to work June 15, 1989 after stocking the boat with necessary equipment and supplies. 15 survival suits, another self deploying life raft and other lifesaving and fire prevention equipment were brought down by company representatives. My job with this vessel was to carry oil spill cleanup workers out to the sites where oil had been detected. I would be dropping of at Port Bailey and continuing on to Hallo Bay on the mainland this first trip. Hallo Bay was a staging area for a number of vessels and their crews. 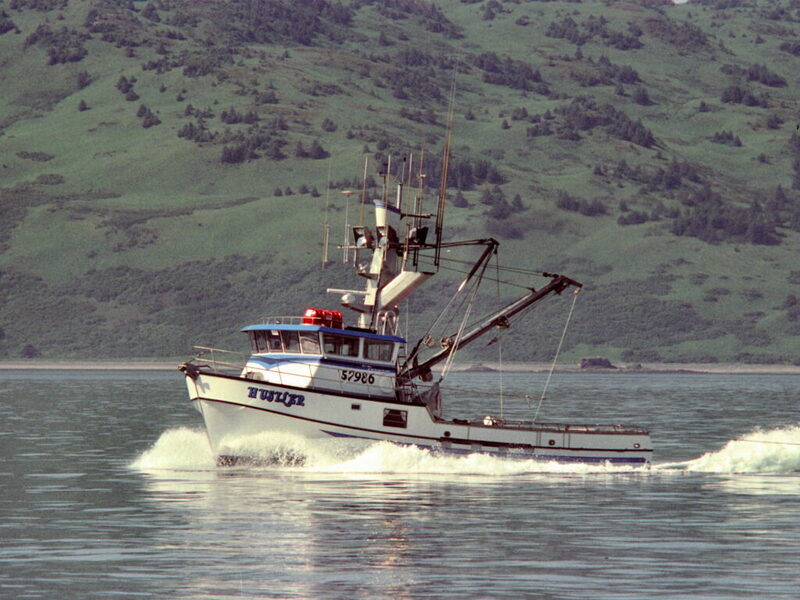 From those sites and others I was to pick up workers who needed to return to Kodiak. My only crew the first few trips was my partner the dentist’s son. He was young but a hard worker and eager to learn. Our first load consisted of 15 passengers. 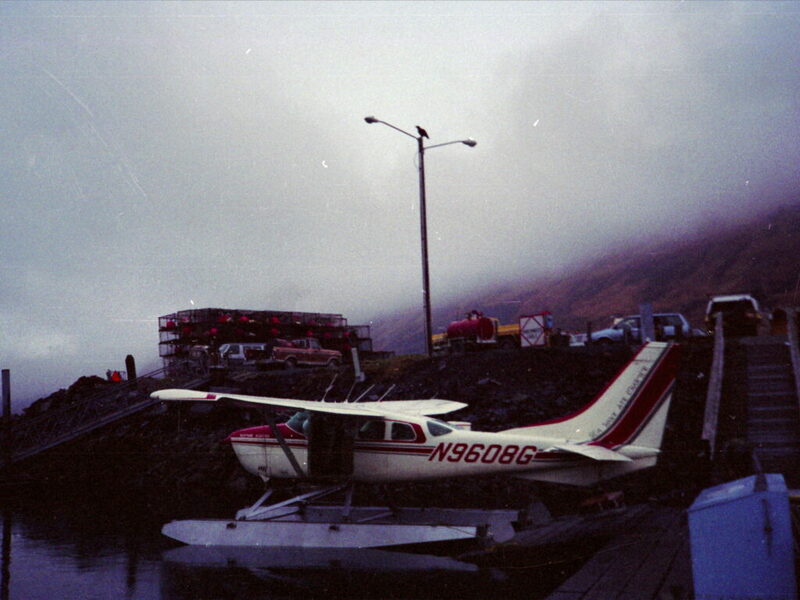 Four hours out of Kodiak I dropped off a passenger at Port Bailey northwest of Kodiak. The trip so far had been in protected waters and all of the passengers were in good spirits. It was a beautiful sunny day. We passed many vessels I recognized as fishing friends. 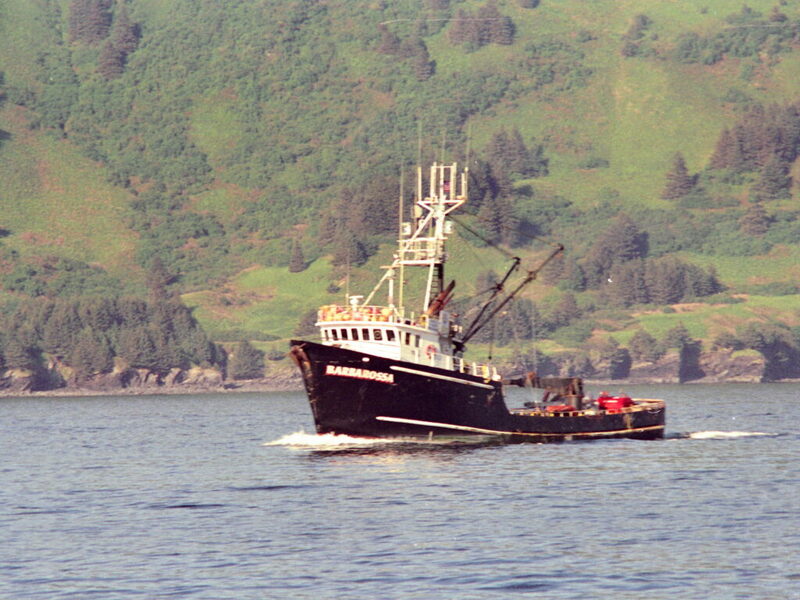 All of the fishing seasons from Prince William Sound to south of Kodiak were closed because of the spill. I hoped some of the vessels I passed were headed to waters outside of the spill impacted areas. The wildlife we encountered did not seem the worse for wear. 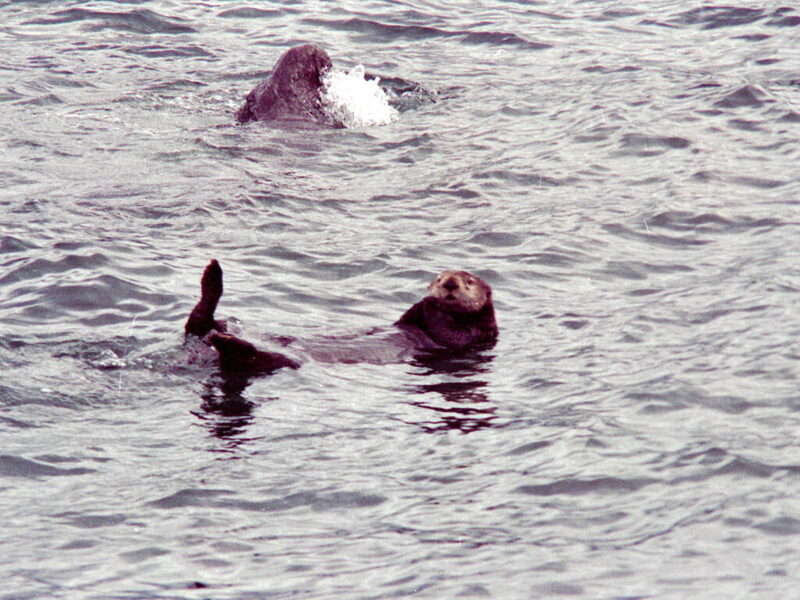 i was happy to see many groups of sea otters alive and well. After seeing the many dead ones to the north I had been worried we had lost all of them. After I cleared Whale Passage I decided to feed my passengers. More friends passed as we entered Kupreanof Straits. A charter boat passed as I gave the helm to my deckhand and went down and made a very large pot of spaghetti and noodles. The spaghetti meal was a huge mistake. The giant pot of noodles and sauce was consumed to the last drop by my starving passengers. When we stuck our bow out of Kupreanof Strait of course it was rough. The Shelikof Strait was almost always rough. 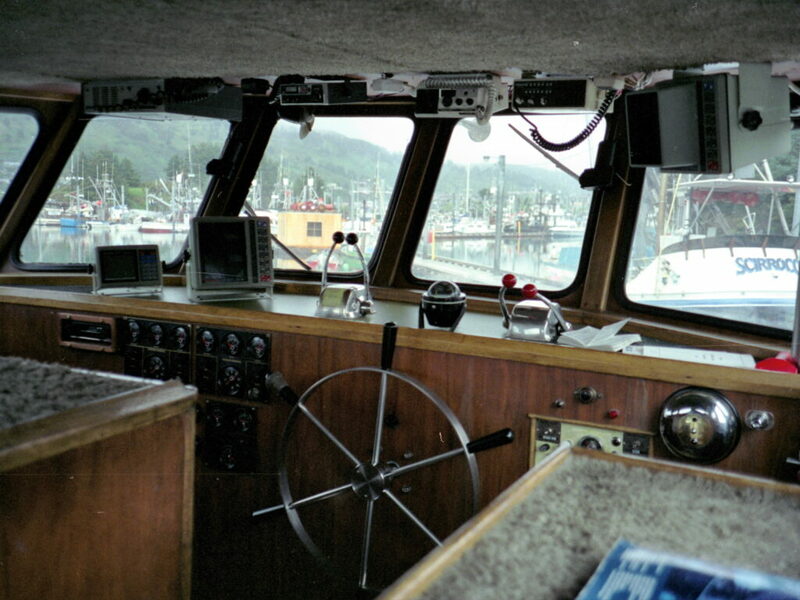 As a veteran of dozens of commercial fishing seasons I prepared my wheelhouse for the tossing and turning that was building. I instructed my crewman to secure what wasn’t already tied down. I had forgotten that these passengers may not be seaworthy. No sooner had the thought crossed my mind than the back deck began sounding like a herd of seals during mating season. Almost every passenger was spewing spaghetti where ever it was convenient. Having experienced seasickness early in my fishing career I empathized with my charges. I slowed down, had my deckhand kick on a deck hose and let time heal the sick. After a half hour or so our single head and courtesy shower were enough to handle the remaining seal callers. Looking from Kupreanof Strait across the Shelikof Strait to the mainland it seemed to be calm. It turned out that was not the case. We did not get into Hallo Bay until midnight. We had 16 persons aboard and all were not in the best of humor. It was freezing cold because the wind was coming down from the mainland. 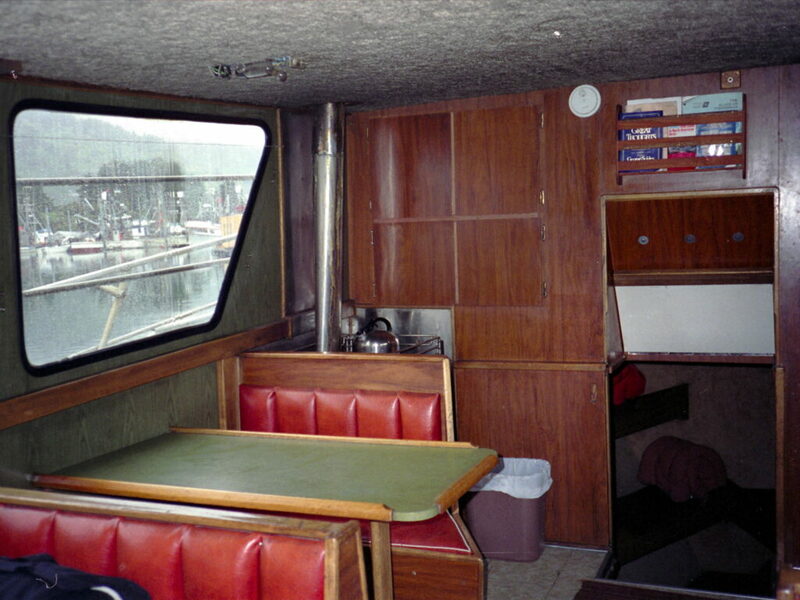 There were fewer bunks than people on board and most could not sleep because of the roll of the boat. 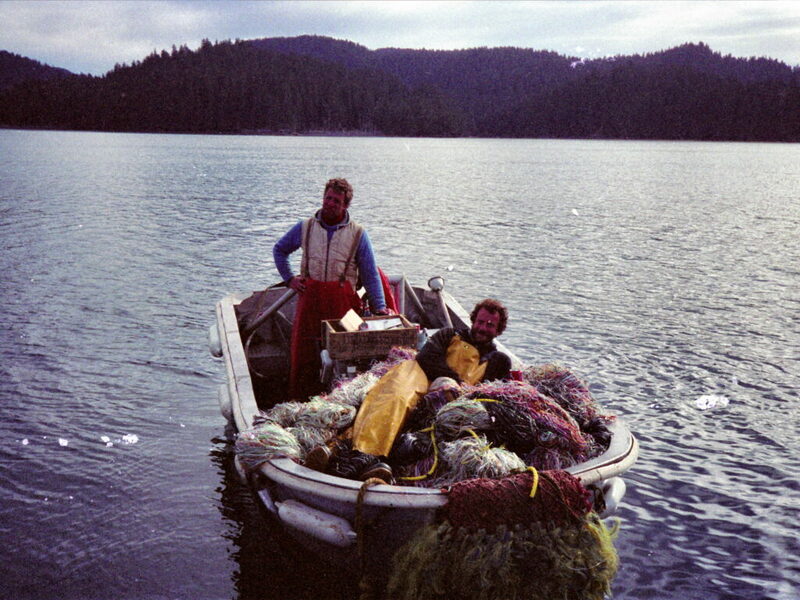 I had passengers for the Yukon Queen, Starfish, Great Pacific and others here in Hallo Bay. Unfortunately no arrangements had been made for transport from my vessel to the other vessels in the event it was too rough to tie up side by side. It was dark, rough and no one wanted to help with the transport. 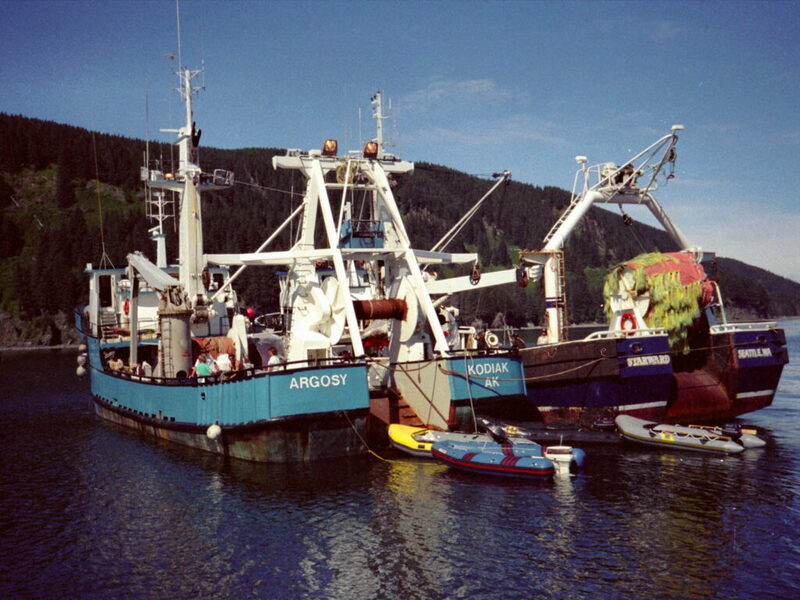 I knew some of the boats were seasoned commercial fishermen and I knew just how to get their attention and assistance. “Some of these gorgeous young ladies I have on board are eager to get to where they are going.” I said over the VHF radio to no one in particular. Behind me the only two females in the group pleaded just loud enough to be heard over the radio. Two skiffs were motoring my way within minutes. We offloaded our 14 remaining passengers and loaded 8 for transport to Kodiak. After anchoring for a much needed nap, we departed Hallo Bay. We dropped two passengers off at Ouzinki on the return trip and got back to Kodiak at 5 p.m. to discharge the remaining six. I was exhausted, as was my poor spaghetti cleaning crewman. For the next three months my job was the same. Pick up clean up workers in town and take them out to cleanup sites. From there I picked up more and brought them back. I found out one of the reasons that there were so many passengers was the drug testing program. Drug tests were being administered before the workers departed for the sites. The results were not ready for a week or two so if the worker failed the drug test they were out on site and needed to return to town. I heard that the fail rate was as much as 75% but when retested two weeks later the rate was much better. The solution was to administer drug tests after the first rotation of a worker. It was a fun crowd I hauled around that summer of 1989. From my perspective aboard my charter vessel the animal life seemed to be in good shape. 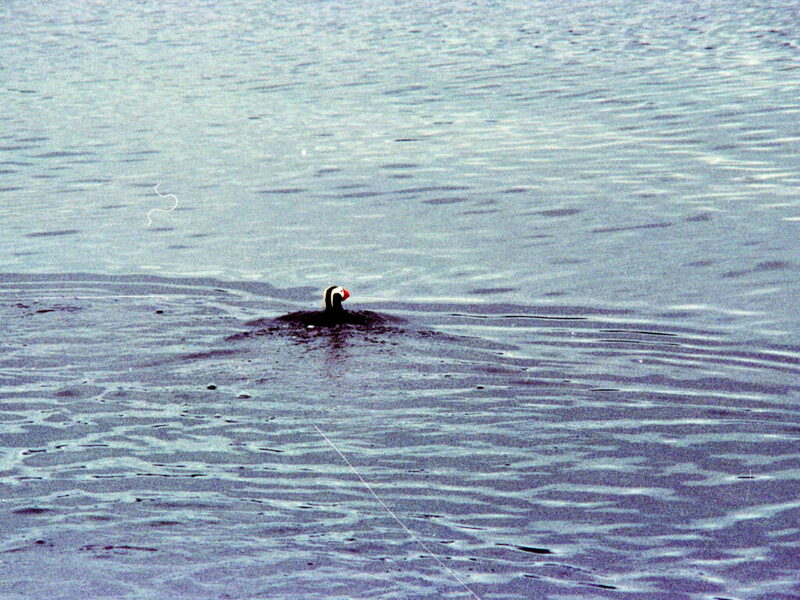 This puffin and many others dodged my wake as I motored by. I couldn’t help but wonder what all the boats I passed were doing. There should have been seiners, trollers, trawlers and longliners passing by but that was not the case. Our fisheries were all shut down. At least I heard all the seasons were closed because of the spill. The load of dungeness crab pot made me wonder. 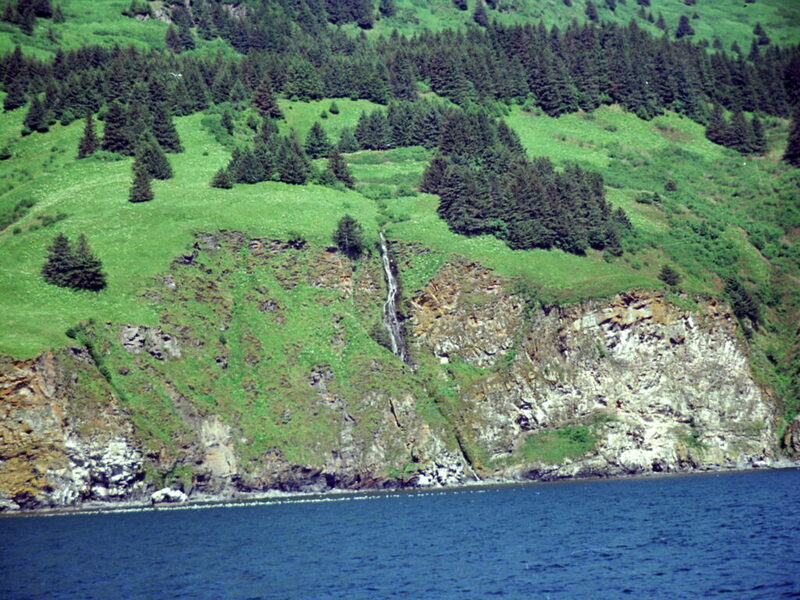 Looking at the beauty of Kodiak and neighboring islands it was hard to fathom that she was soiled and her beaches spoiled. I don’t know how many boats and ships I passed the summer of 1989 but I do know this is the one I wanted to own if I won the lottery. The summer of 1989 passed quickly with little rest. I transported hundreds of workers out to vessels like the Argosy and Starward who were acting as hotels for the cleanup workers. By late summer larger vessels were arriving from the Gulf of Mexico to assist in the effort. What had been thought to be a month or two of work was turning into possibly years. By fall the number of boats zooming by increased. Some I spoke to over the VHF radio. Very few boats wanted to got to work with the cleanup effort because of the hostile feelings about anyone associated with Exxon. Unfortunately they were in charge and the only way you could contribute to the ongoing effort. People took sides but when we passed port to port we just waved not feeling aligned with one side or the other. We were just out doing what we knew how to do and enjoying the view. 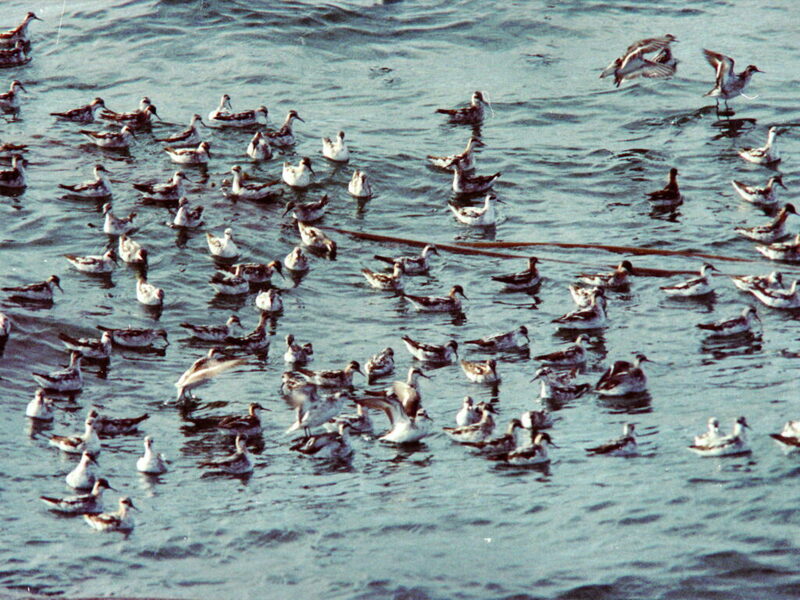 Seeing flocks of birds like this one of Red-necked phaleropes made me realize that the spill was limited in its destruction. I was still angry it happened but knew Alaska was larger and more resilient than was being portrayed on television. 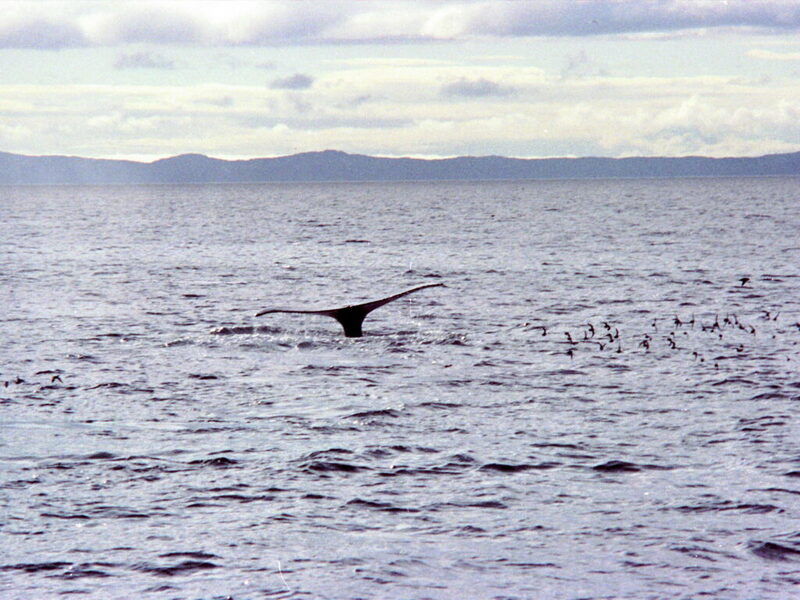 The whales and birds went on about their business as though nothing had happened. I kept passing friends almost every day, like Joe Harlan on the Deliverance. …and Ron Thompson on the Northern Jaeger. Many of the vessels toward the end of the season I did not know. By the first week of September rumors were spreading that the cleanup effort and spill response was going to be shut down until spring. The days were getting shorter and September usually brought with it the gales of fall. My last week was hectic but I was ready for a break. I had been going for almost three months without a break. I had brought aboard a second skipper so that I could sleep while we were traveling, but the pace was one similar to fishing. In the end I was ready for a break. Between September 1 and September 6, 1989 I shuttled around 106 passengers. In the middle of it all there was an earthquake 70 miles north of Chignik that caused the evacuation of Kodiak. No tsunami showed up but the entire fleet headed out to deep water anyway. It was a crazy end to an even crazier year. I was told when I turned in all my company owned equipment that there would be work likely come spring. I was used to fishing seasons ending and taking time off. It turned out I was off charter from September 7, 1989 until April of 1990. More story and photos to follow shortly. 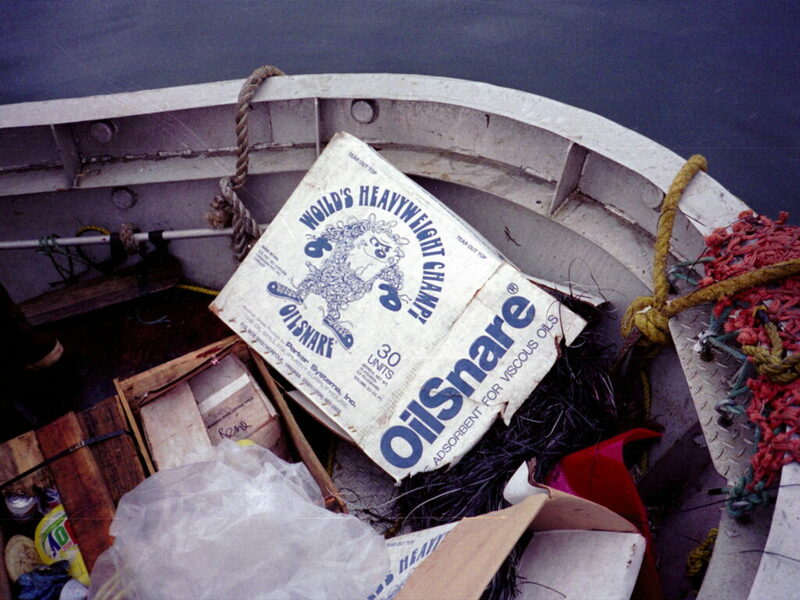 The 30th Anniversary of the Exxon Valdez Disaster is coming up March 24th. If you are a media outlet and need photographs or an interview for an Exxon Valdez story please contact me at warren@alaskashipwreck.com and I will respond immediately. I do not charge for the use of my photographs or interviews but do request that you purchase a copy of my “Alaska Shipwrecks 1750-2015” book and donate it to your local library. 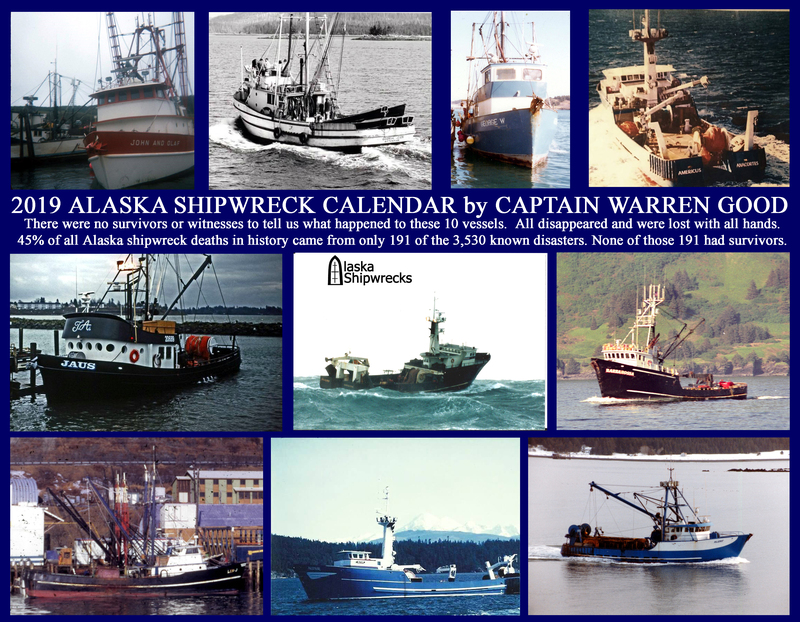 The 2019 ALASKA SHIPWRECK Calendars are now available at Lulu.com. 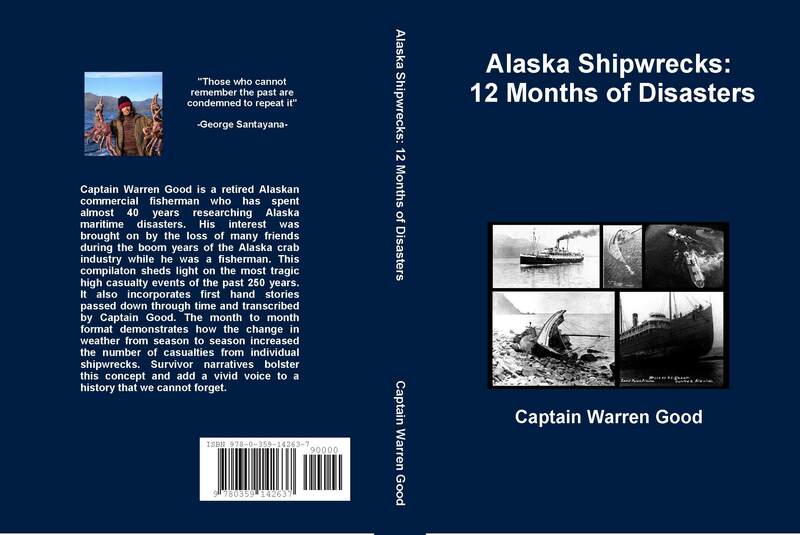 I have also just released a new book called ALASKA SHIPWRECKS: 12 Months of Disasters. It is an accounting of the most significant 275 Alaska shipwrecks in history. First hand accounts from survivors are presented in addition to the descriptions of the disasters. 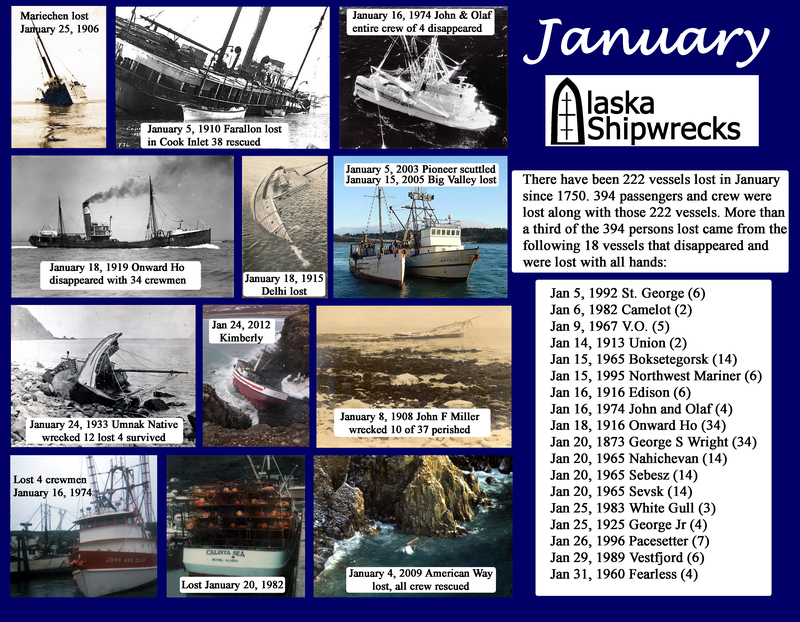 The book is presented in a month by month format and compliments the Alaska Shipwreck calendars very well. Go to Lulu.com and search Alaska Shipwrecks to find both the book and calendar. On this year’s calendar I am spotlighting the vessels that have disappeared and been lost with all hands. They account for a high percentage of all deaths in history that happened during the cold weather months. ALASKA SHIPWRECKS 1750-2015 by Captain Warren Good and Michael Burwell is now available on demand in both soft and hard cover. Hardcover books are being discounted by 20% and softcover by 30% for orders purchase directly from Lulu.com. Please follow the yellow link to order softcover and blue for hard. This is the second edition of ALASKA SHIPWRECKS and contains much more information than the previous work including expanded detail and information particularly on the larger and more significant shipwrecks in Alaska history. Thousands of names of those lost have been researched and are published in this Alaska shipwreck encyclopedia that have never been available before. Captain Warren Good has combined forces with marine historian Michael Burwell to produce the largest and most complete accounting of Alaska shipwrecks ever. The First Edition of ALASKA SHIPWRECKS: 1750-2010 will soon become unavailable and out of print, to make room for a new edition later this year. If anyone wants a copy of my original and first edition work for their collection, they can be purchased by going to Lulu.com and searching the book title or my name; Captain Warren Good. The new version will be titled ALASKA SHIPWRECKS 1750-2015 and I will be co-authoring with marine historian Michael Burwell. We hope to have that one available this summer. On April 3, 1979 a survival suit was manufactured in California. These suits, also called immersion suits or exposure suits were becoming popular with the Alaska fishing fleet for surviving in the icy waters of the north in the event of a shipwreck. Each was often marked with the name of the manufacturer and a serial number specific to that suit. On November 19, 1982 one of these survival suits washed up on a beach in Hawaii with the remains of a young man in his early to mid twenties in it. He was wearing a survival suit manufactured on April 3, 1979. We know because it had a serial number. 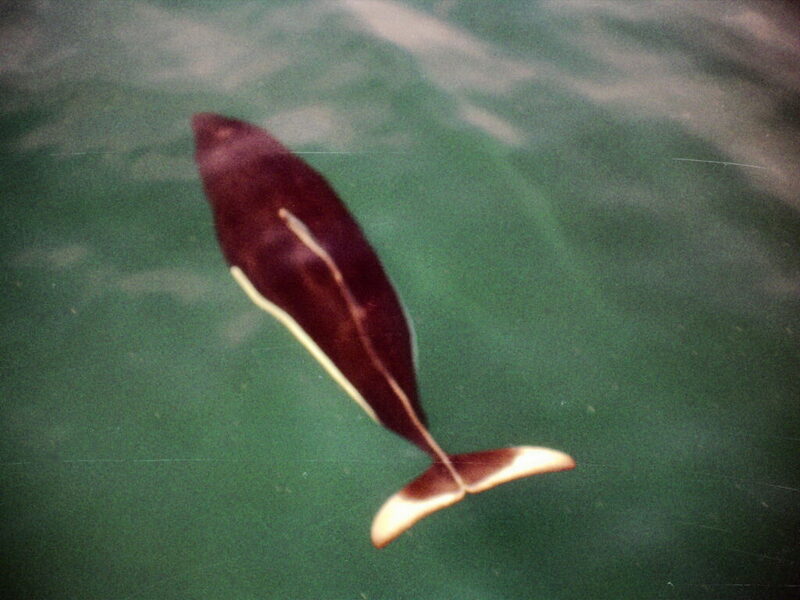 He appeared to have been in the water for a very long period of time. This young man has yet to be identified. Technology and science have advanced greatly in the 36 years since that survival suit washed up in Hawaii. Studies indicate that it would take a floating object from a shipwreck near Alaska at least two years to arrive in Hawaii traveling in the Alaska Stream Current to the North Pacific Current and then on to Hawaii. It is possible that the young man who washed up in Hawaii came from a shipwreck in Alaska. I have gone over all Alaska shipwrecks after the April 3, 1979 date that the suit was manufactured until the middle of 1981. After mid-1981 it is very unlikely that something or someone would have the time to drift to Hawaii and arrive by the November 19, 1982 date when the body in a survival suit washed up in there. The wrecks that stand out from April of 1979 until mid-1981 are the Hellion of November 23, 1979, Gemini of January 15, 1980, Norel March 17, 1980 and Commander of November 21, 1980. I am looking for your help. If you know anyone or anything about these four vessels, please contact me at warren@alaskashipwreck.com as soon as possible. With all the new advancements in science and technology, we may be able to solve this sad shipwreck cold case from 1982. July 30, 1956 The 30 foot troller Linda swamped and sank. No one knew what happened to the vessel until a message in a bottle was found off of Yakutat in the Gulf of Alaska a full year later. The message came from the only occupant of the Linda, 16 year old Orville Rude, son of the owner. He had been taking his father’s boat to Inian Pass from Elfin Cove to fish when the vessel swamped. August 1, 1969 Canadian halibut fishing vessel B C Clipper exploded and sank off of Twoheaded Island near Kodiak. Five crewmembers were rescued but three were lost. A liquid gas line from the galley freezer broke and caused the initial explosion when the gas was ignited by the galley stove. Winston Tucker and his son Clarence Tucker, both of Vancouver were lost along with Charles Stanley of New Westminster. 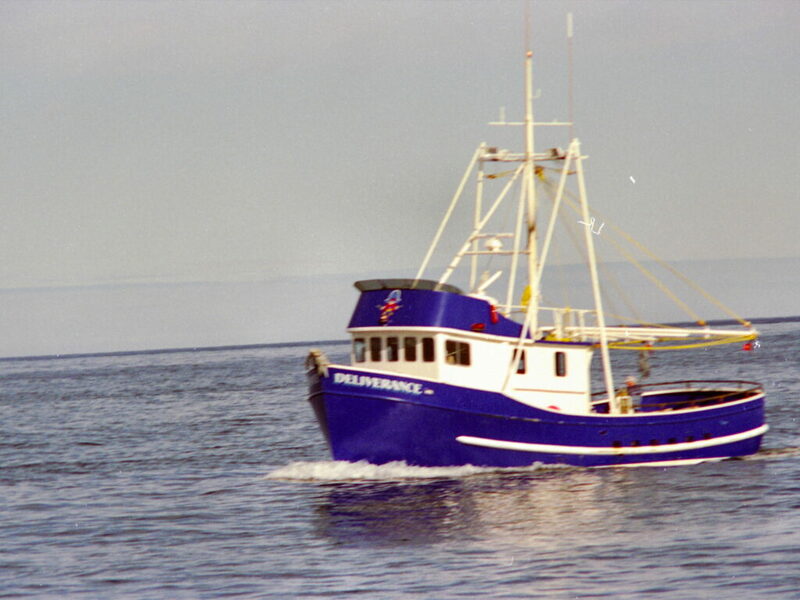 Five survivors were rescued by the fishing vessel Peggy Jo. August 3, 1966 the Columbia Wards Fishery Company cannery, four buildings and about 50 stored fishing vessels were destroyed by fire 10 miles north of Naknek on the Kvichak River. The buildings had not been used for canning since 1958. 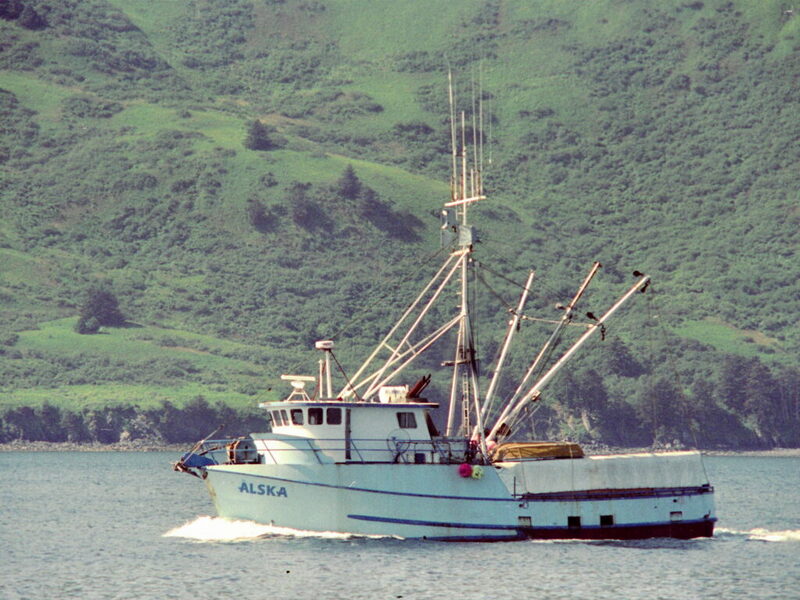 They were primarily used to store gillnet vessels for the North Star Fish Company and Alaska Fish Company. August 3, 1888 the Young Phoenix, Mary&Susan, Ino, Fleetwing and Jane Grey became trapped in ice and lost. 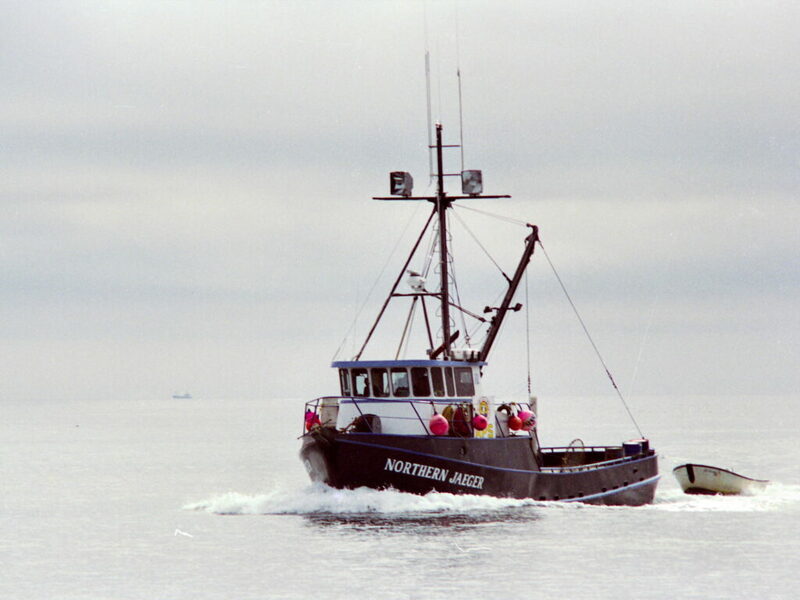 The crews were rescued by the United States Revenue Cutter Bear. Summer is a relatively calm time of year and shipwrecks are less frequent. Small boat accidents are more common and tragically sometimes multiple family members are involved. Such was the case July 25, 1976 when the 34 foot wooden gasoline powered salmon troller Miller’s Bay disappeared near Noyes Island with three family members aboard, including Robert West (31), his wife Judy (30) and their 14 year old daughter Brenda. July 25, 1921 the Libby McNeil and Libby salmon cannery at Kenai was destroyed by fire with an estimated loss of $300,000. July 26, 1924 the Alaska Sanitary Packing Company cannery at Wrangell was destroyed by fire. The loss was estimated to be $200,000. July 28, 1916 the Nakat cannery near Ketchikan owned by the Humes Interest was destroyed by fire. 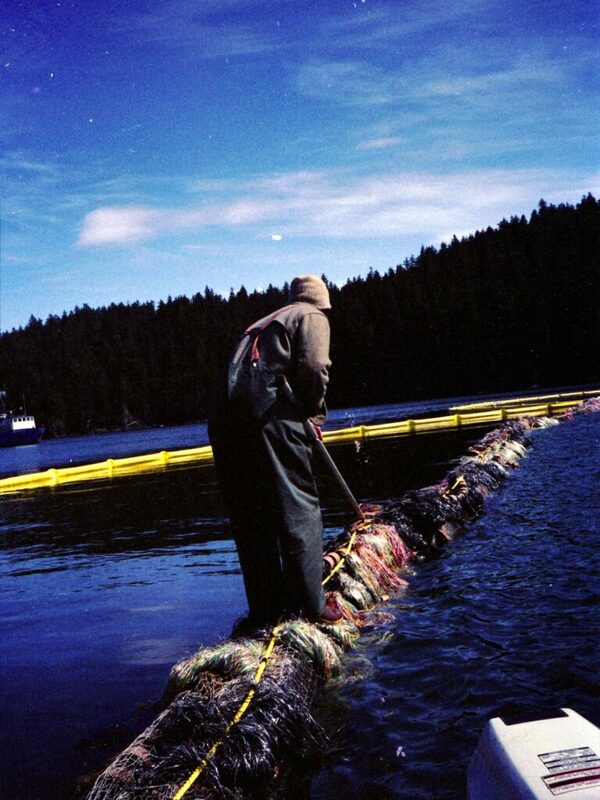 Only a few hundred cases of salmon had been packed. July 18, 1935 The wood hulled gas screw Bessie M caught fire Tuesday at 1:30 p.m. while at the float dock at Excursion Inlet. No one was on board at the time. The vessel was towed away from the dock and a hole was chopped in her side subsequently sinking the Bessie M and “checking the flames”. 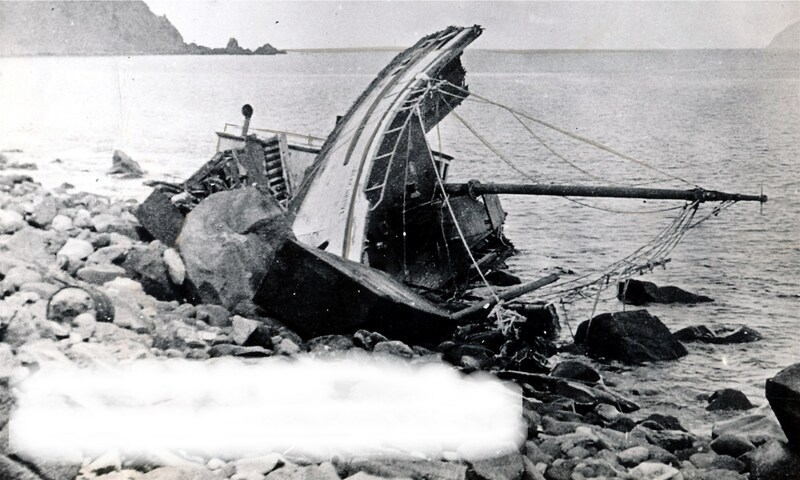 Because of the sinking, her engine and the lower part of the hull were saved. The cause of the blaze has been attributed to “gas fumes”. I am including this small event because there is a lesson that many mariners should pay attention to. 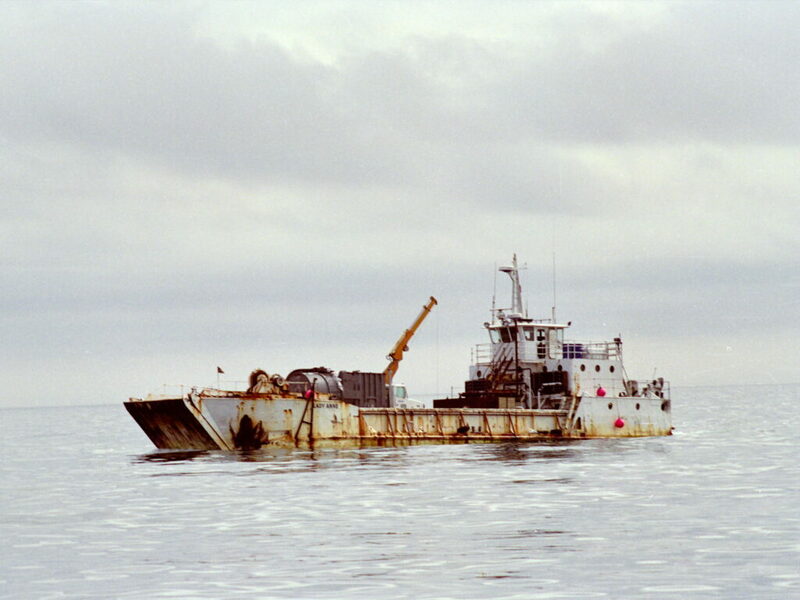 Literally hundreds of vessels have burned and become total losses in the Alaska marine environment without the simple action that was taken to stop the flames and save this boat. The Bessie M was put it in “Wet Storage” until she could be re-floated and the damage repaired. This method is seldom thought of in the heat of the moment. Another example I have in my files is of a vessel owner who puts out an engine room fire by blasting holes in the hull below the waterline with his shotgun. July 19, 1903 the Kenai salmon cannery owned by Pacific Packing and Navigation Company was destroyed by fire. Once owned by Pacific Steam Whaling Company, the cannery could produce 60,000 cases of salmon a season. There was enough insurance to cover the loss. One of the primary functions of this website is remembering not just the vessels lost in Alaskan waters but the people lost with them. That information is not just historically interesting, it is important to families and their descendants when a loved one is lost to maritime disaster in Alaska. With that in mind, I have posted a new, never before seen list of 461 names of people that may have been lost when the Princess Sophia sank in 1918. The official counts vary from 343 to 356 persons lost. The Sophia is Alaska’s worst maritime disaster to date. There were no survivors, with the exception of one of the passenger’s dog. What I have done to to arrive at such a large number of people lost relative to the official count is to include all names that were published as passengers or crew lost when the vessel went to the bottom. I used newspaper publications from Alaska, Oregon, Washington and British Columbia. I also included the most comprehensive list published in book form. None of those lists appear to have ever been complete. There are just too many names. Many of the names on my list are of people whose bodies were identified but never included in the official count. This list is unofficial and likely incomplete, but may prove helpful for locating a missing ancestor. Now that the list is published online, the names will come up in searches. For the complete list go to the A to Z section and pick the letter P. Once there scroll down to PRINCESS SOPHIA. At the end of the list is a link to download the complete list, color coded and in .pdf format.